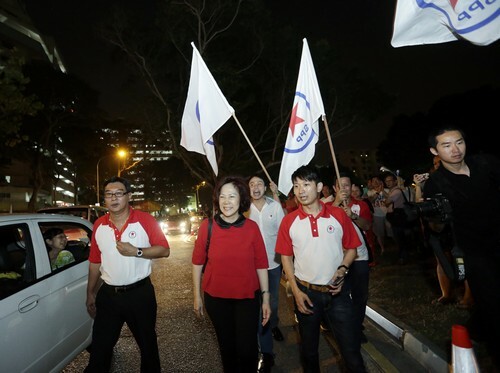 There is no effective opposition in Parliament to check on the ruling People's Action Party (PAP), Singapore Democratic Party (SDP) chief Chee Soon Juan said yesterday. 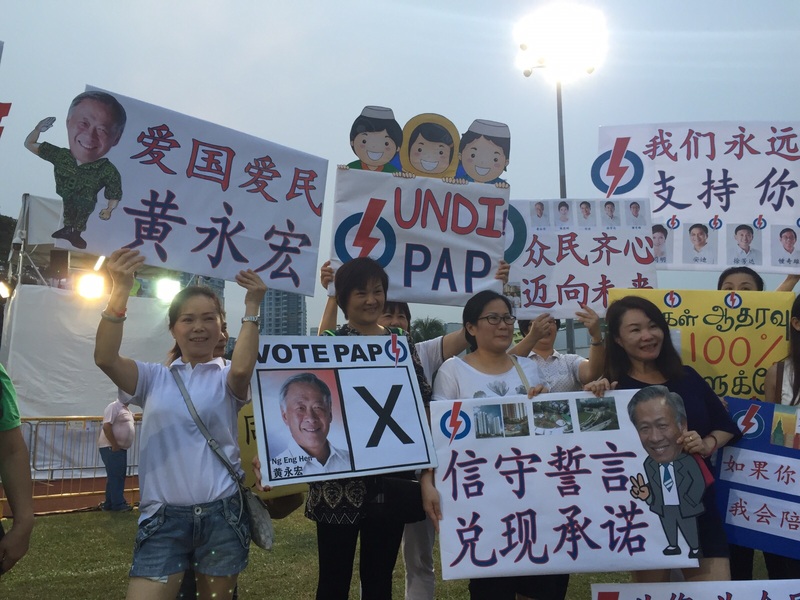 For this reason, the PAP "does as it pleases and is making dangerously wrong decisions without proper scrutiny and accountability", he added. 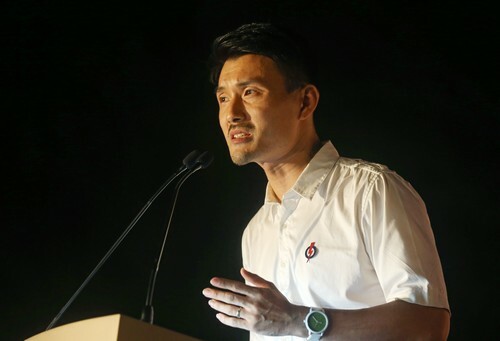 Dr Chee was scathing as he attacked the PAP for what he called "a shocking lack of judgment" in how it prioritises its spending. 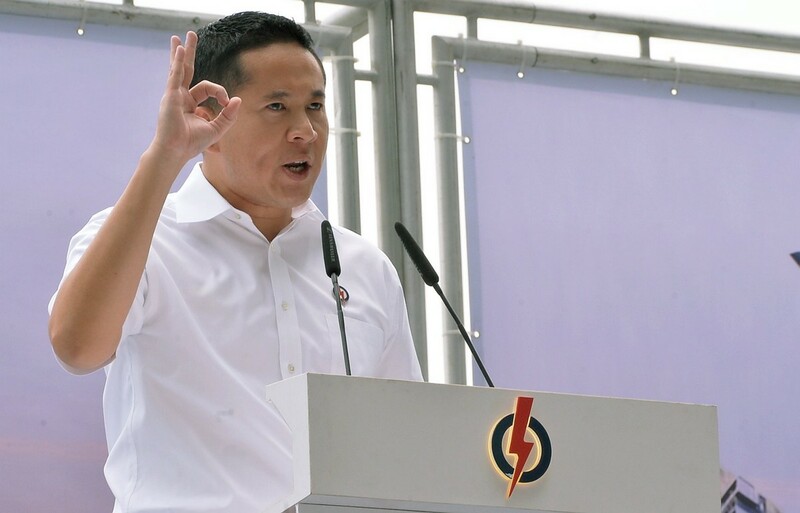 It was "tooting its horn, throwing confetti and doing cartwheels" earlier this year, said Dr Chee, over setting aside nearly $4 billion in healthcare subsidies for the next five years. 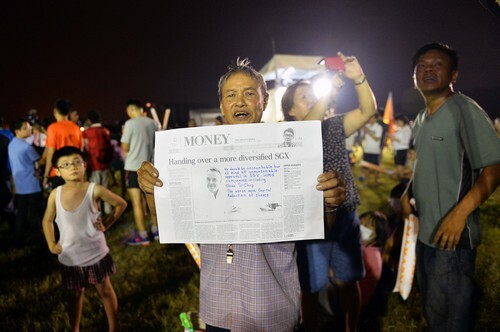 Yet, in recent years, there have been "failed" or "questionable" decisions made by the sovereign wealth fund GIC and Singaporeinvestment firm Temasek Holdings, he added. 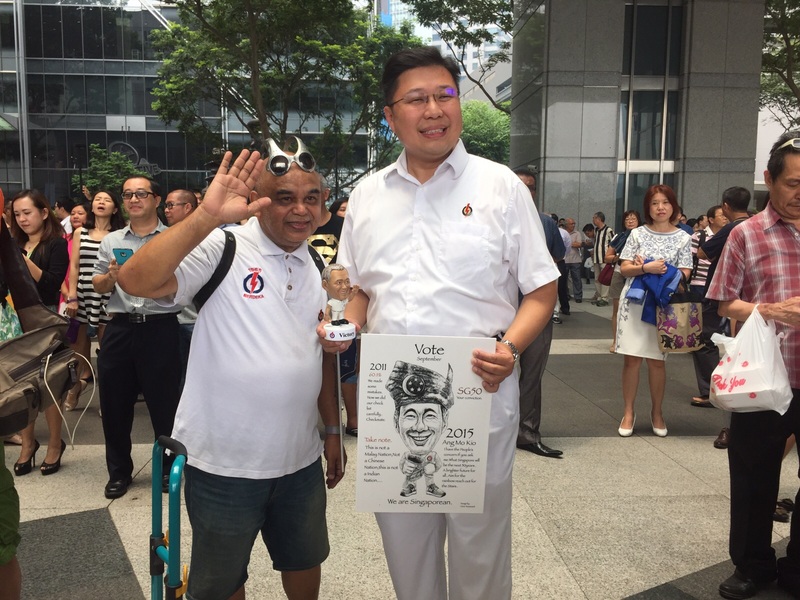 Dr Chee highlighted several examples to the crowd of office workers at the promenade outside UOB Plaza, implying that the money would have been better used on healthcare to tackle the problem of an acute shortage of hospital beds. 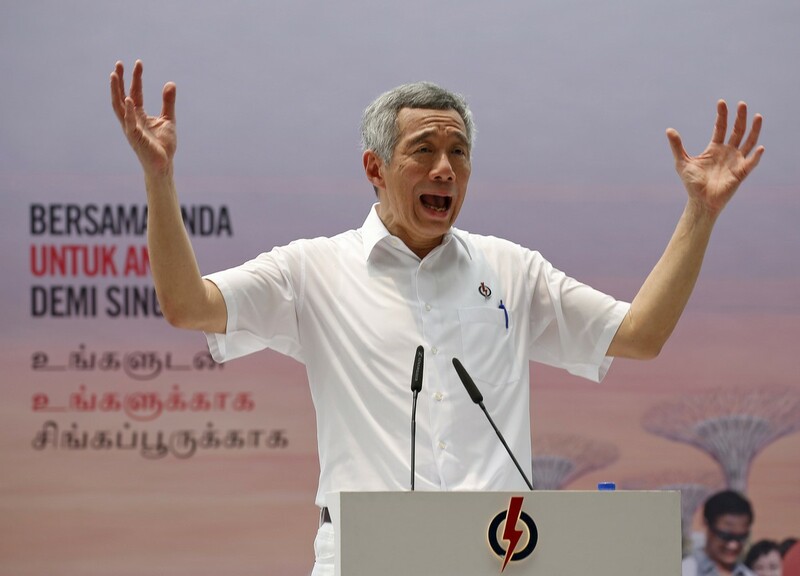 Temasek, he said, had invested about $4 billion in "debt-ridden" commodities trader Olam International last year. 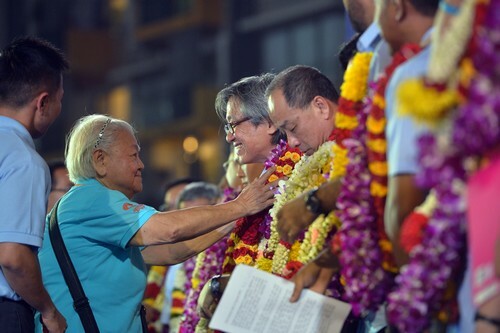 It also led a consortium to buy Thai telecommunications conglomerate Shin Corp for a similar sum in 2006. 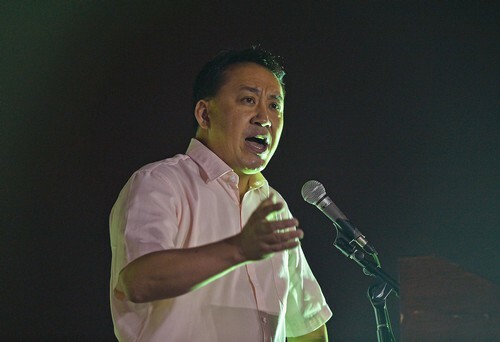 "This Government accuses (SDP) of coming up with policies of tax and spend, but what they do is take our reserves, go out, and make all these failed investments," he said. 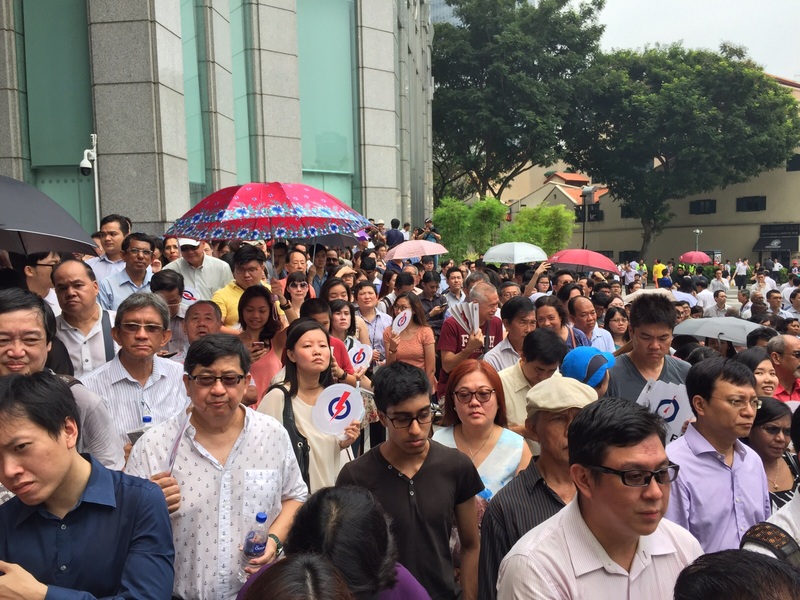 "This is the kind of situation we have when there is no effective opposition in Parliament... to check on the PAP." 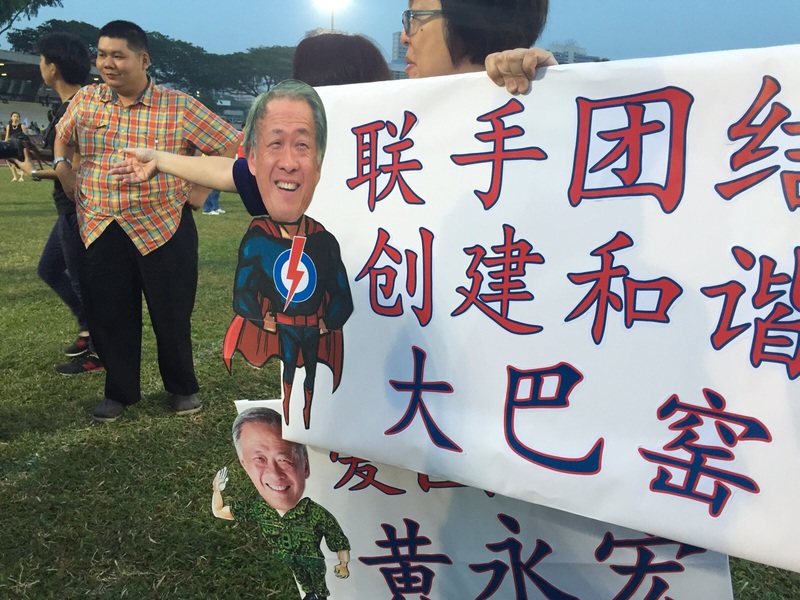 Dr Chee, however, ignored altogether the profitable investments the two organisations had made. The Finance Ministry has also said repeatedly that the Government plays no role in decisions on individual investments made by the duo. 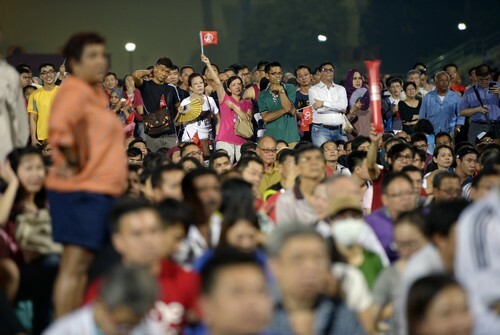 In the last Parliament, the opposition comprised seven elected MPs and two Non-Constituency MPs (NCMPs) from the Workers' Party, and one NCMP from the Singapore People's Party. 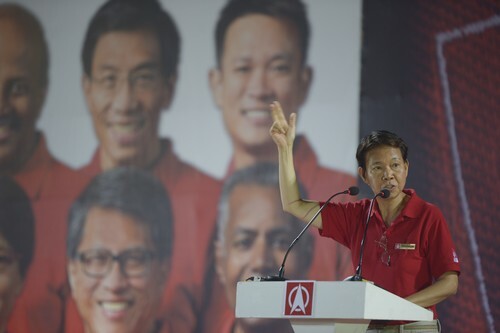 Dr Chee, 53, is leading a team to contest Holland-Bukit Timah GRC. 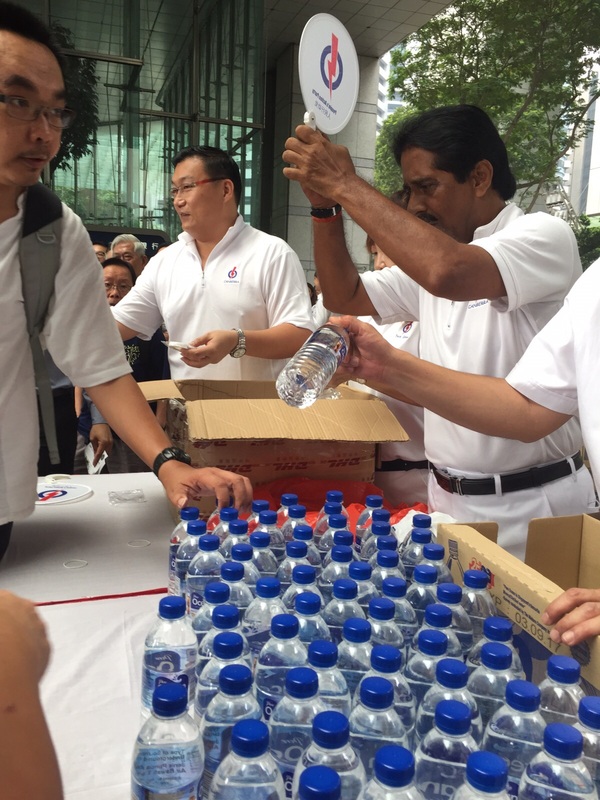 It includes medical professor Paul Tambyah, 50, who also spoke at the rally, where he praised Deputy Prime Minister Tharman Shanmugaratnam for being "the most brilliant of our current ministers". 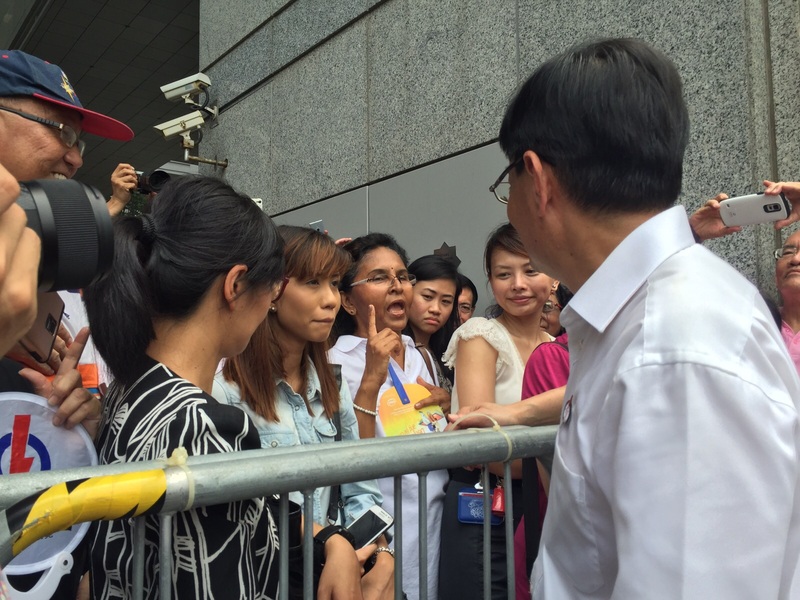 "Many of us think he will make a fine PM," said Dr Tambyah. 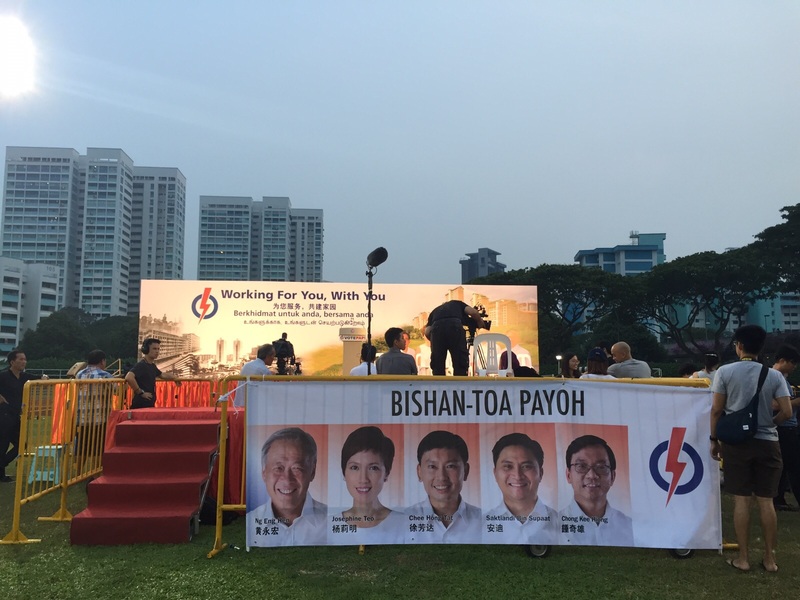 "Many of us in the alternative parties hope that, one day, DPM Tharman will fall out with PM Lee (Hsien Loong) and will come out and lead a grand coalition of opposition parties." 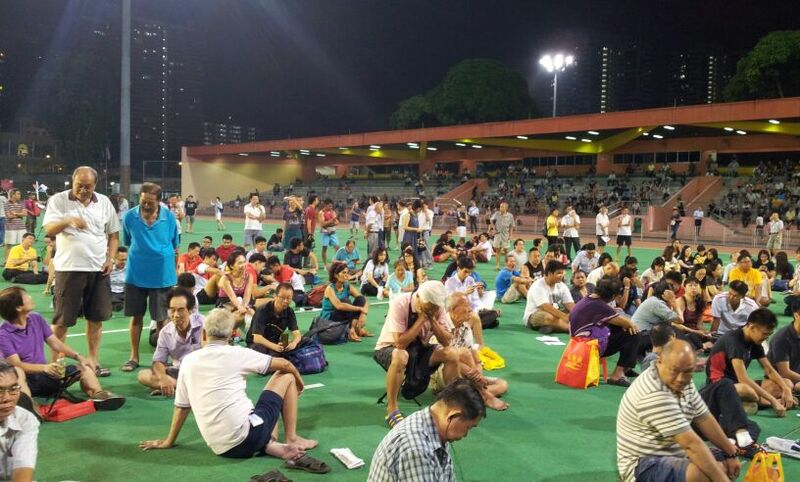 This article was first published on September 8, 2015. 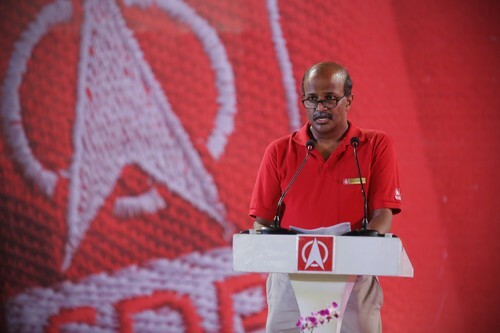 Professor Paul Tambyah, a SDP candidate in Holland-Bukit Timah GRC, speaking at a rally held at the Jurong East stadium on Sep 6. 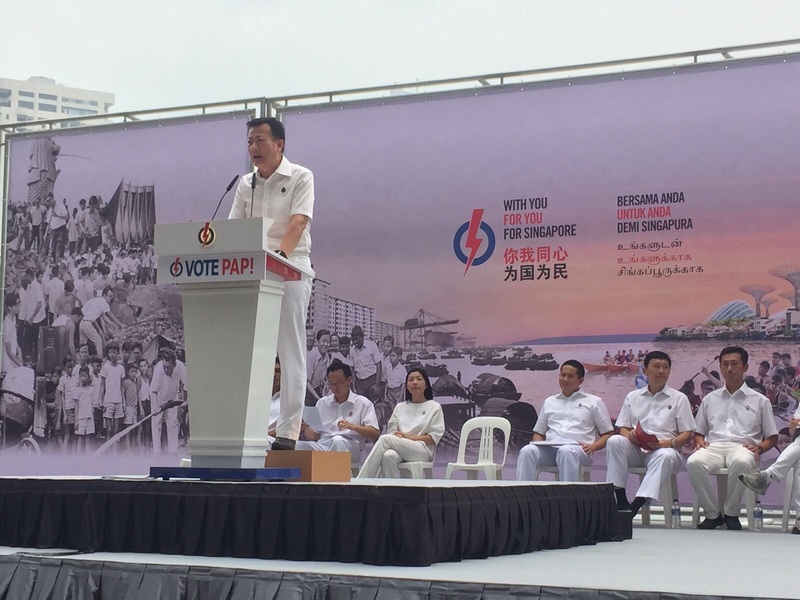 Dr Wong Souk Yee from the SDP. 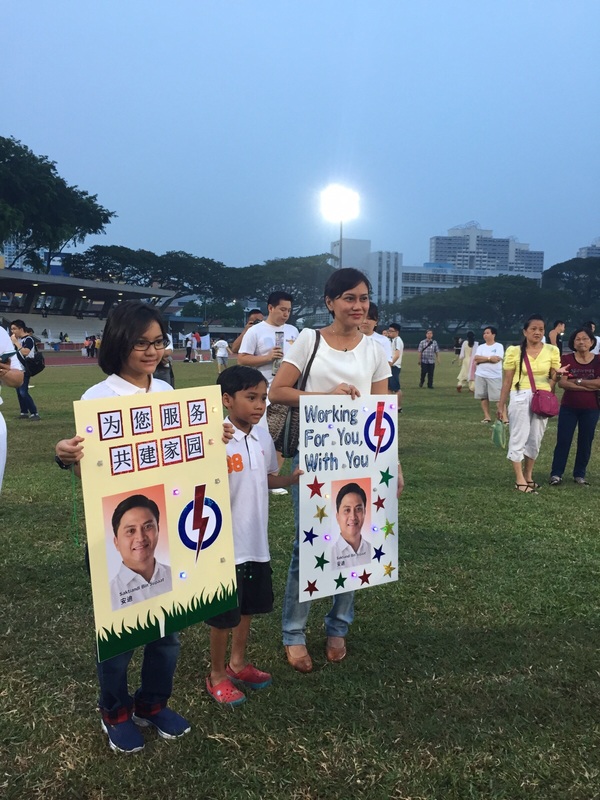 Ms Camilla Chiam, daugther of Mr Chiam See Tong and Mrs Lina Chiam. 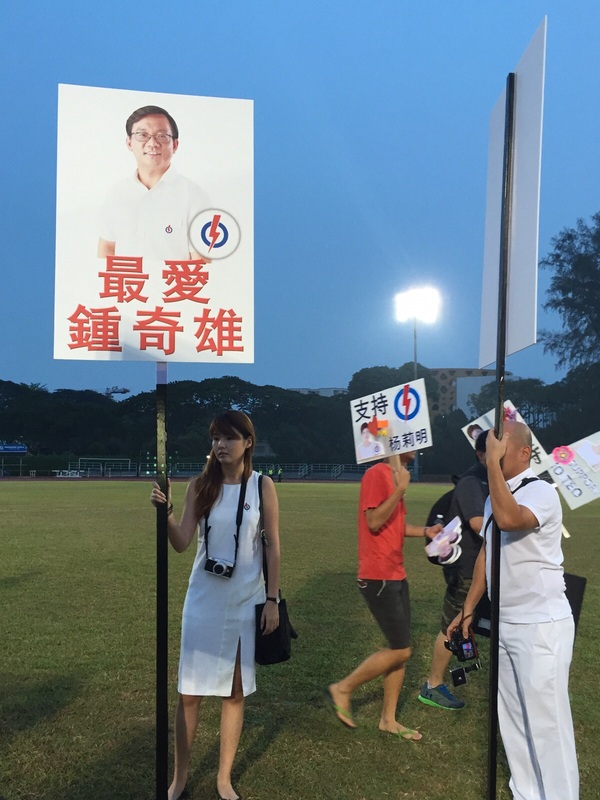 Mr Chiam See Tong, wife of SPP candidate Mrs Lina Chiam. 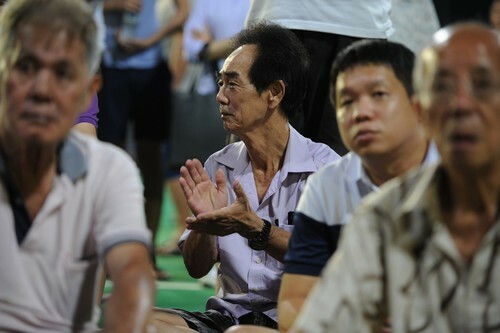 Retiree, Mr Toh Peng Ting, 77,protests at the NSP Rally for Sembawang GRC at Woodlands Drive. 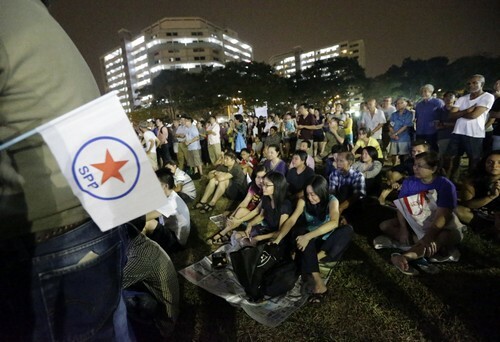 Workers' Party supporters at the party's rally tonight. 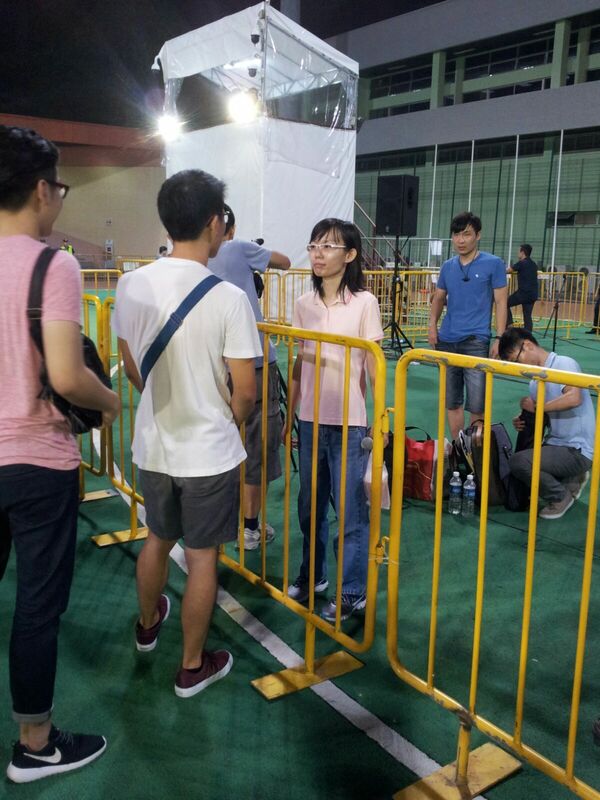 Amos Yee was spotted at WP's rally at Serangoon Stadium. 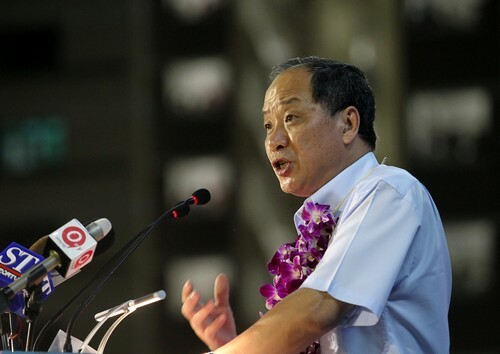 WP's Mr Low Thia Khiang. 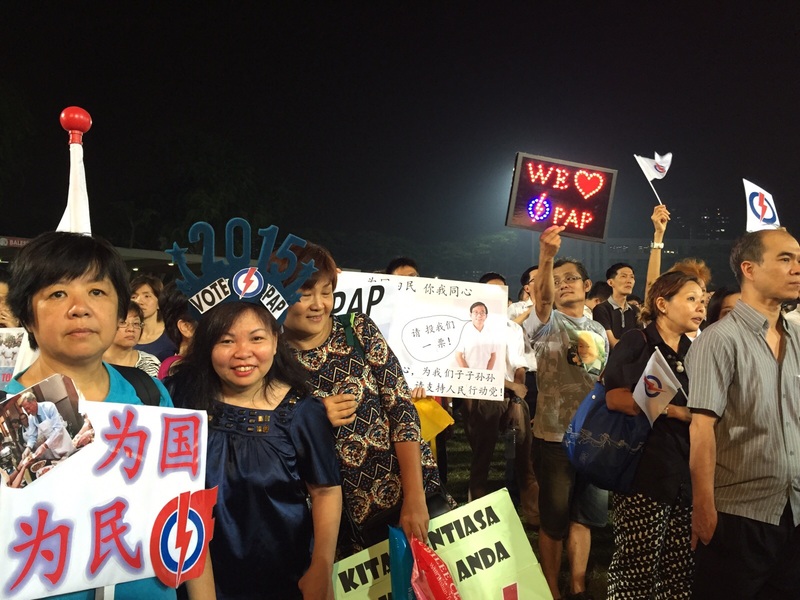 PAP supporters are at the PAP rally tonight at Toa Payoh Stadium. 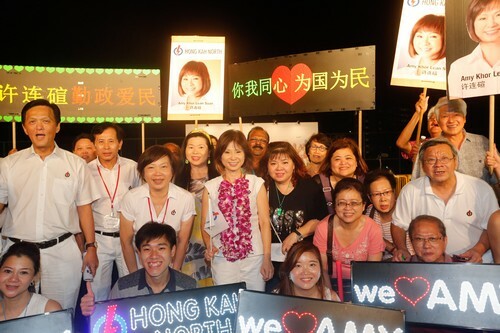 PAP's Dr Amy Khor and her supporters. 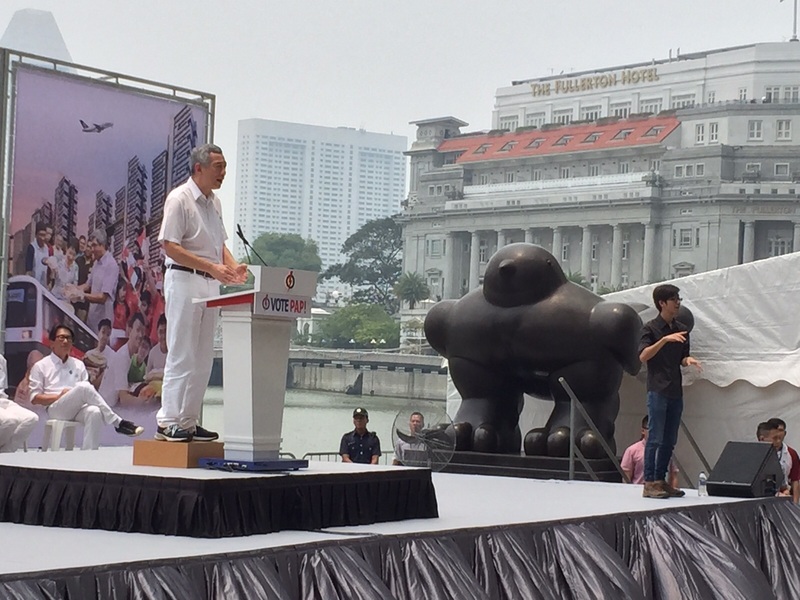 Dr Ng Eng Hen takes the stage. 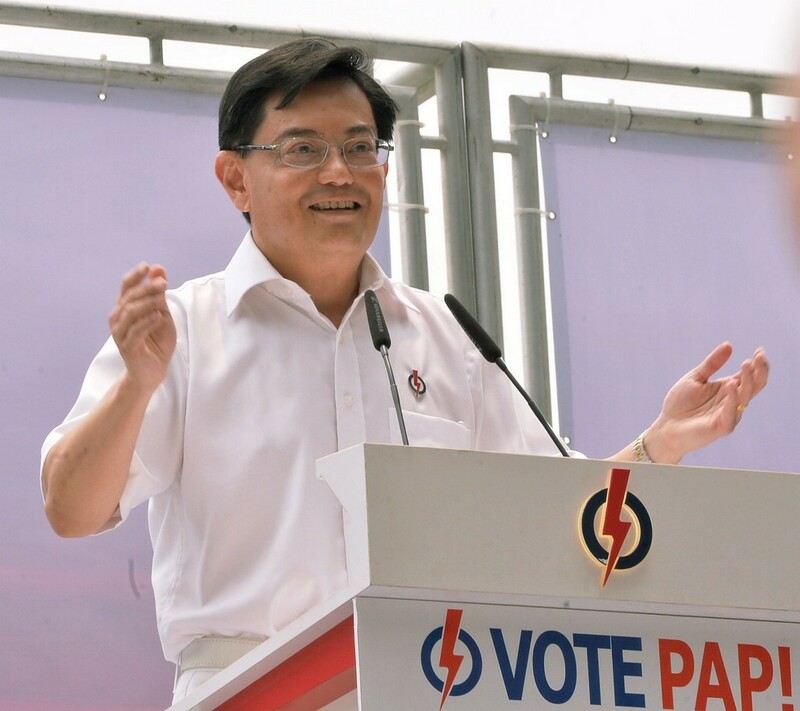 Education Minister Heng Swee Keat. 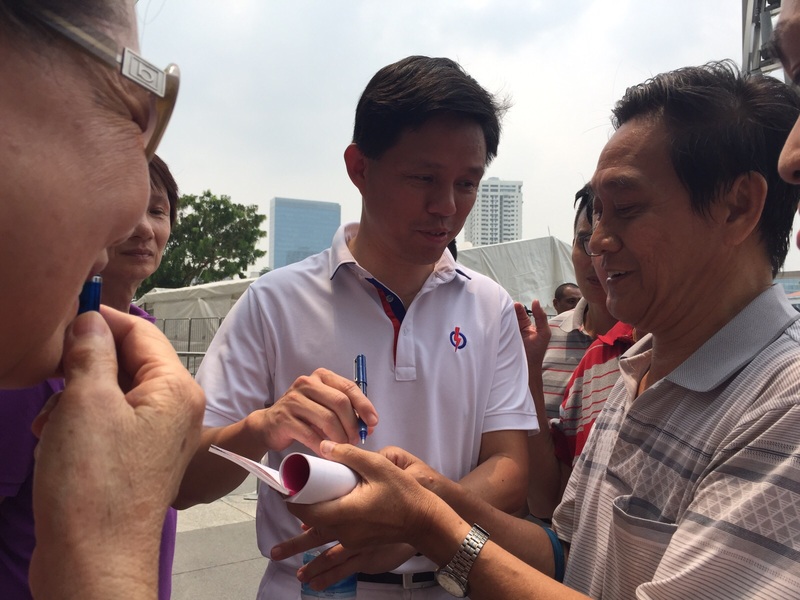 PAP candidate for Tampines GRC Desmond Choo. 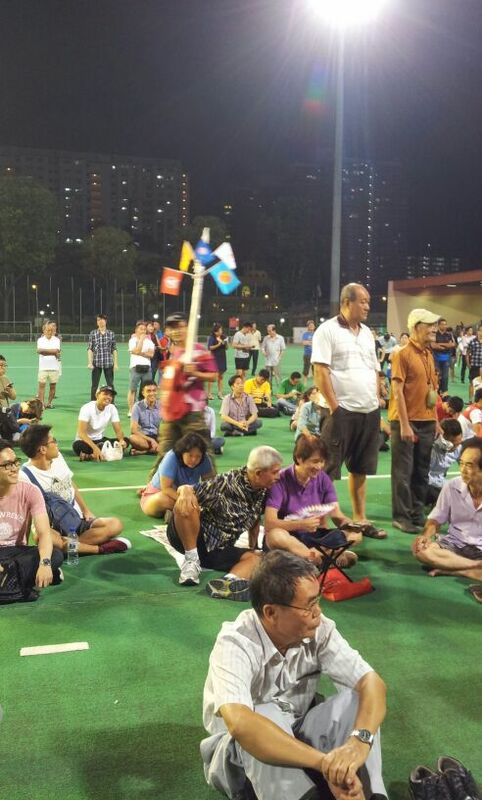 Supporters who are still waiting for Radin Mas SMC candidate Han Hui Hui to appear for her rally. 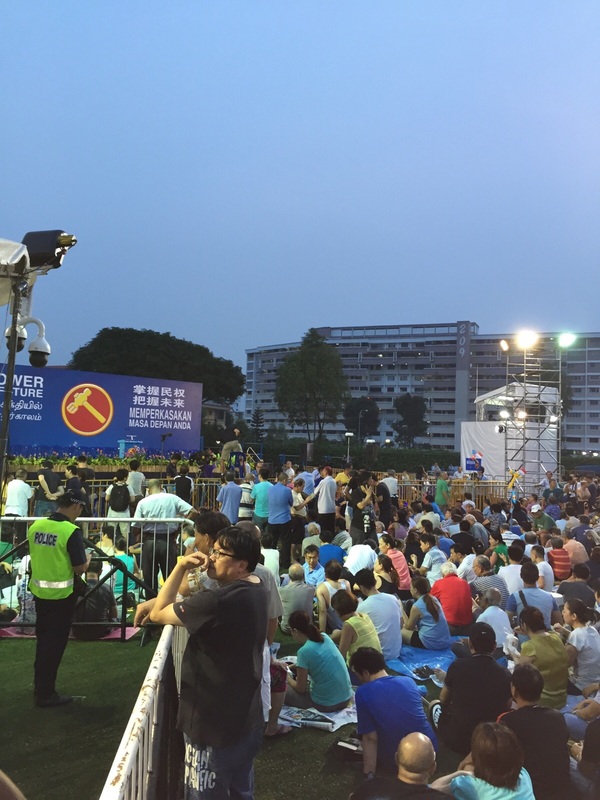 Han Hui Hui's rally begins an hour after the scheduled times. 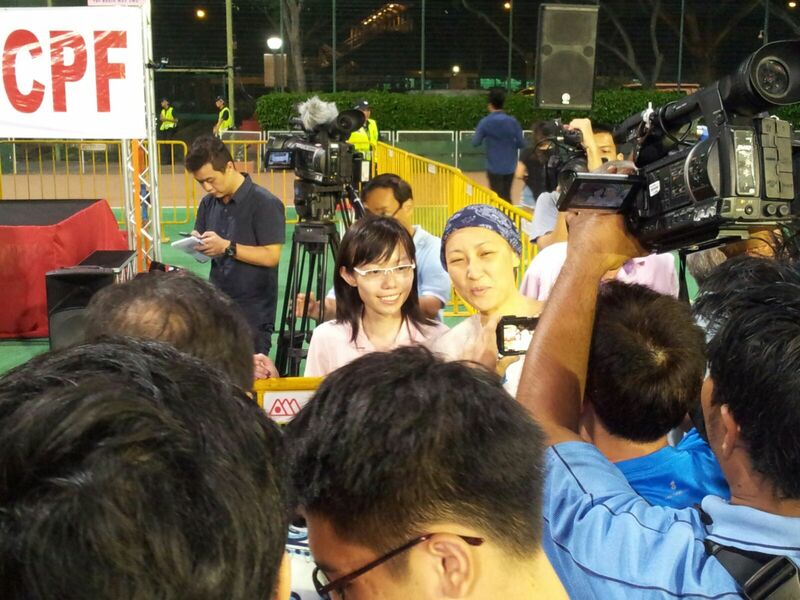 Ms Han after her rally has ended. 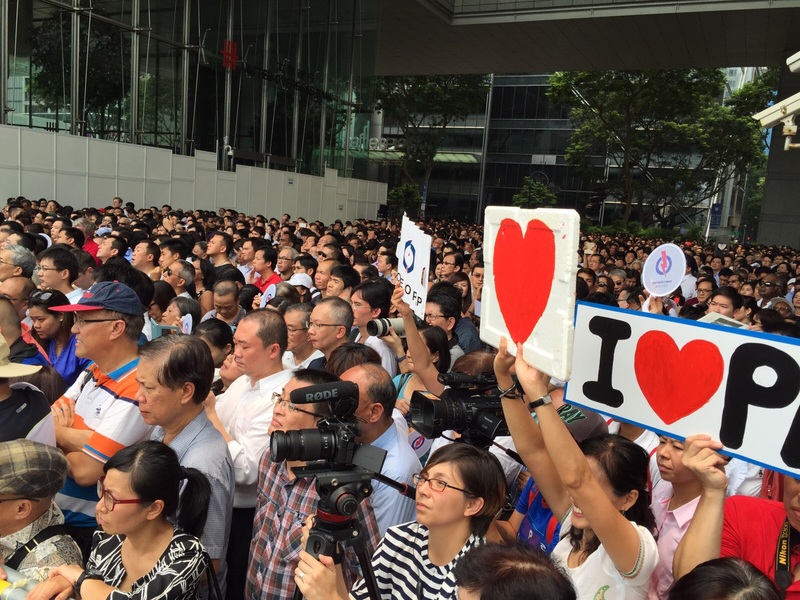 AsiaOne was live at PAP's lunchtime rally at UOB Plaza. 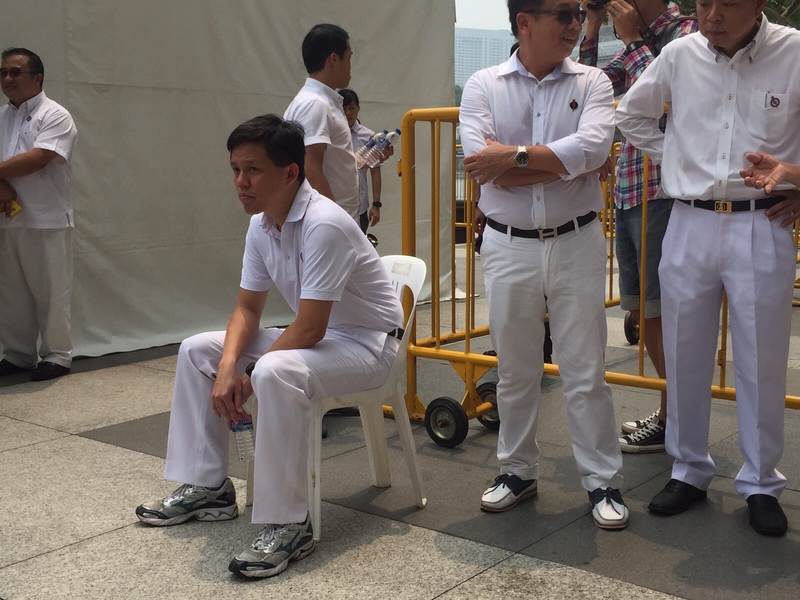 Chan Chun Sing waiting for the rally to start. 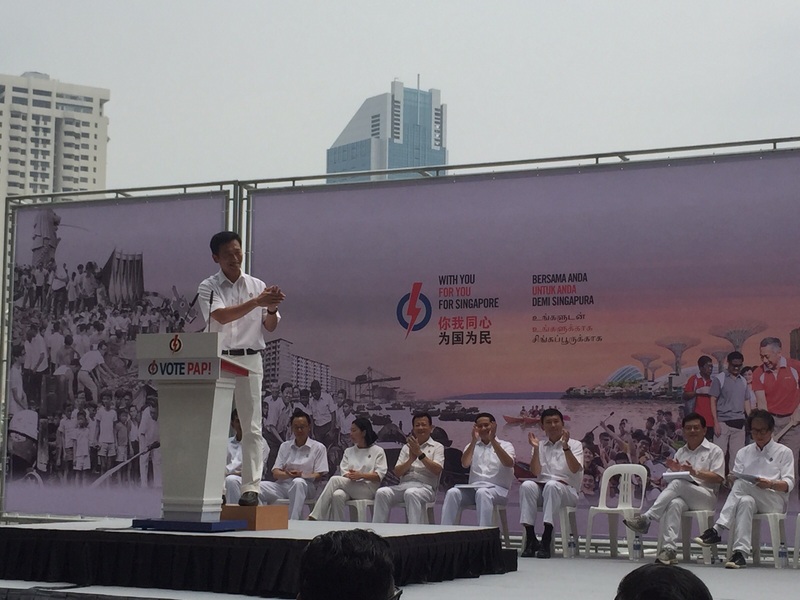 Sembawang GRC candidate Ong Ye Kung takes the stage. 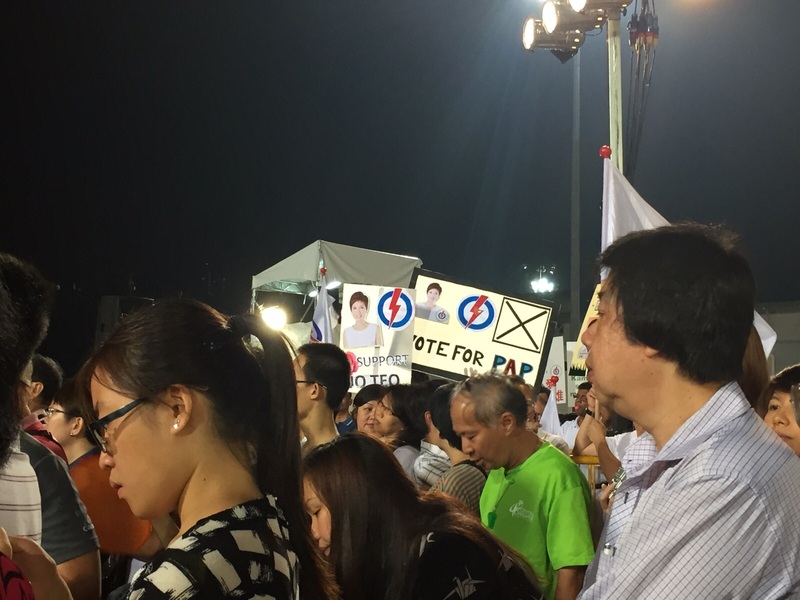 He says his father was a Barisan Socialis member and that him running for the PAP made him an unlikely candidate. 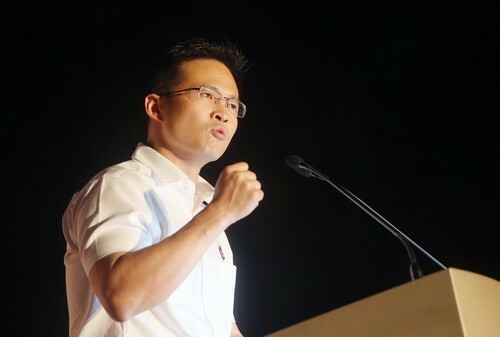 Mr Ong: "If we lose too many seats, any ruling party will resort to populist policies. 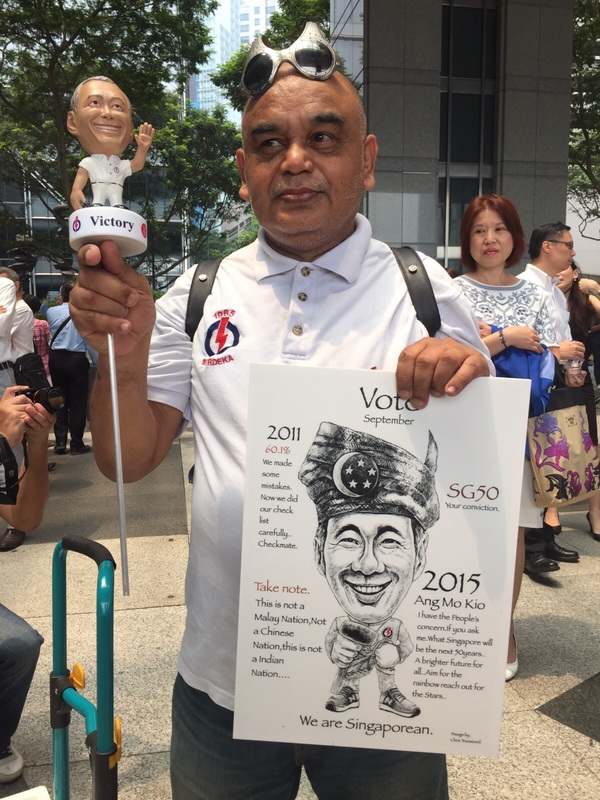 We may lose sight of the SG100 vision." 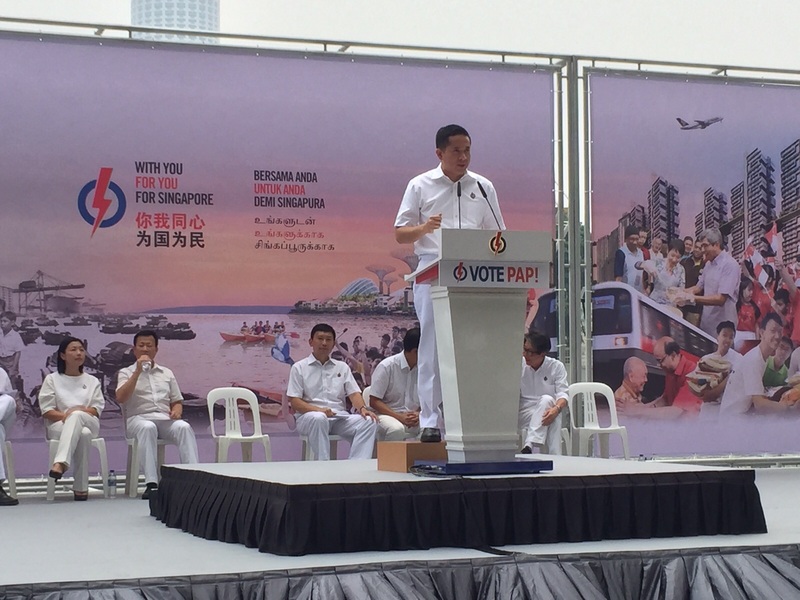 He says that Singapore's politics must be able to balance continuity and change. 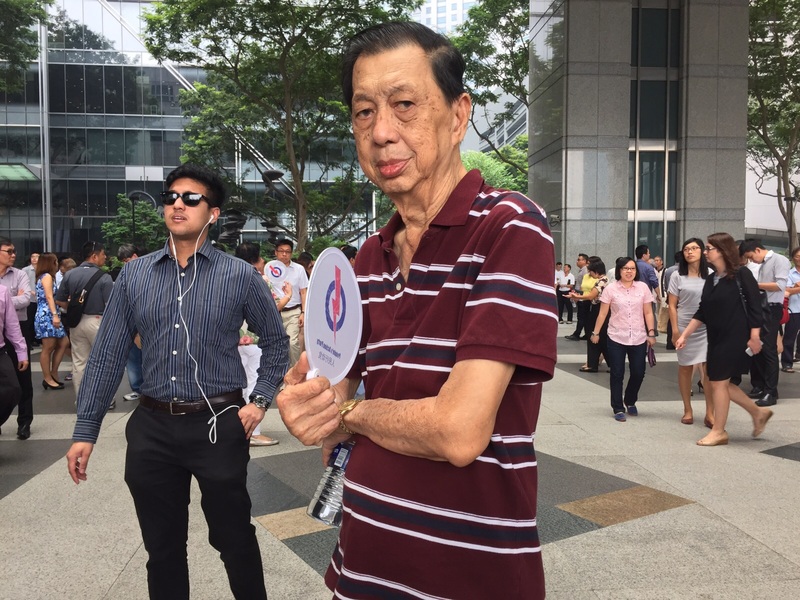 He says that in today's Singapore, it takes even greater courage to say that the system is still working. 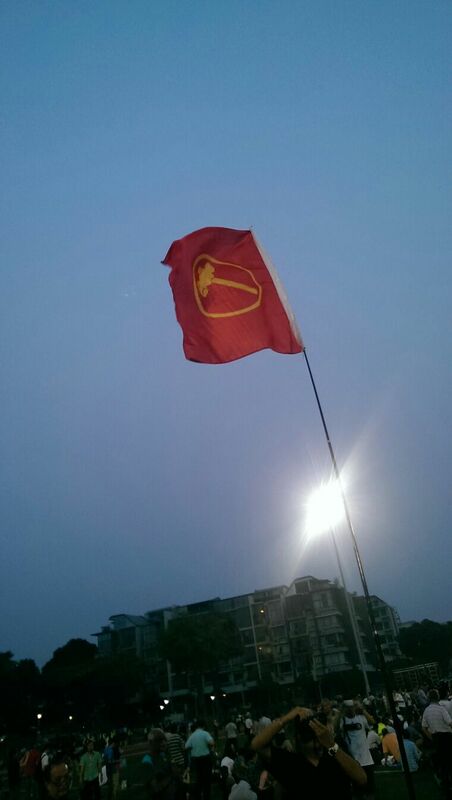 Have an evolution not a revolution. 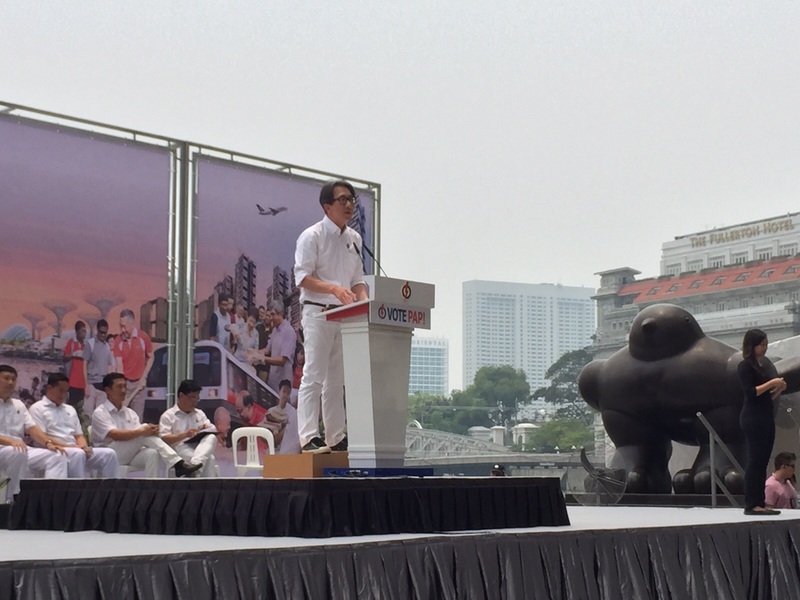 Aljunied GRC candidate Victor Lye takes the stage. 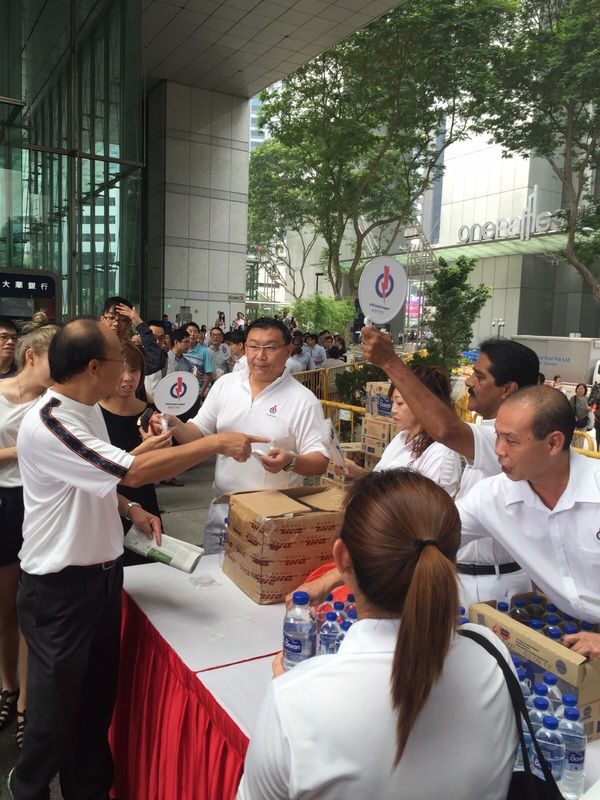 He said he volunteered there in 1999 to help people who suffered in the Asian Financial Crisis. 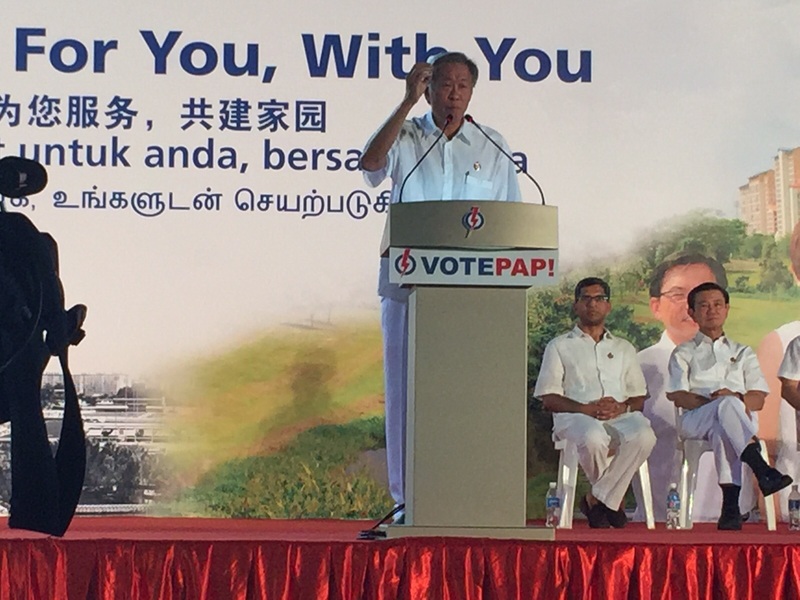 He said that when PAP lost its Aljunied ward it was a cry for better resident-government connection. 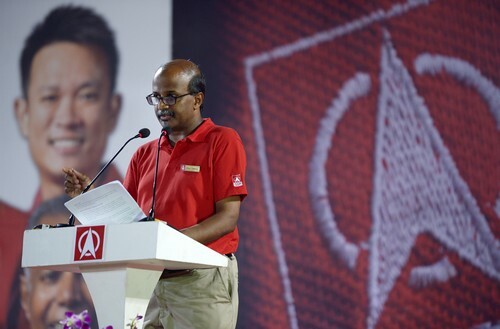 Sembawang GRC PAP candidate Amrin Amin takes the stage. 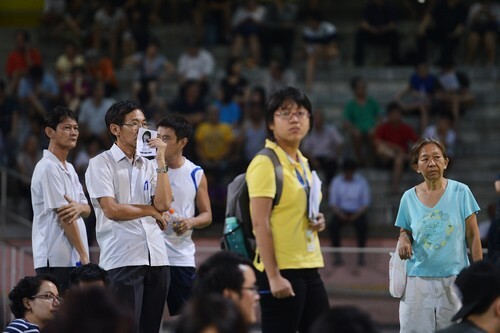 He says he went to ordinary schools in Singapore and that his parents took on multiple jobs to support the family. 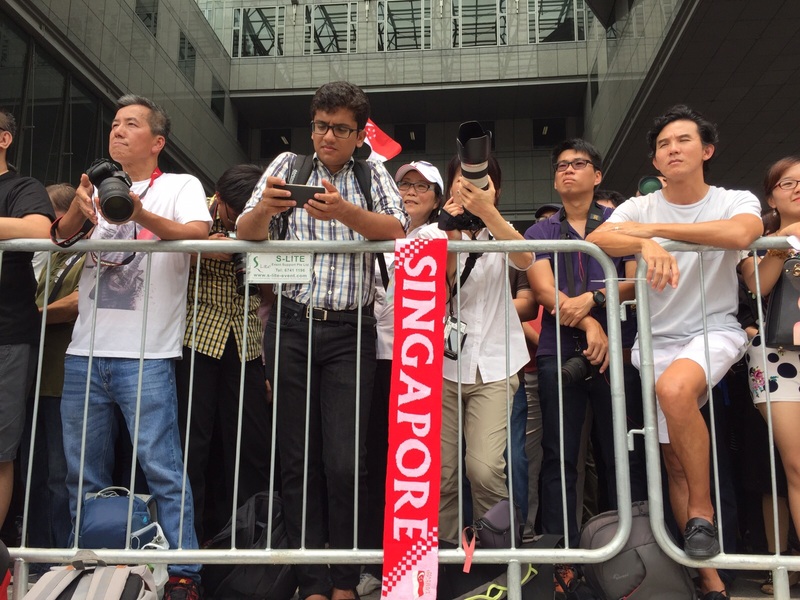 He is now a lawyer. 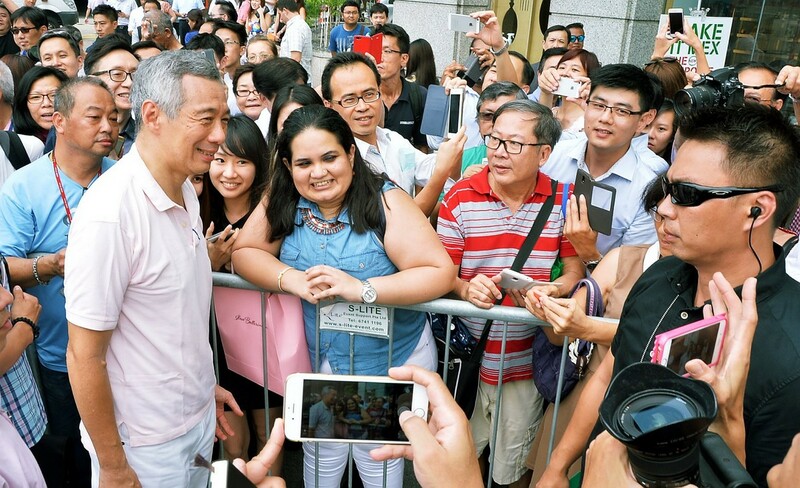 He said that it is rare that a person of a minority background in most places can receive the opportunities that he did in Singapore. 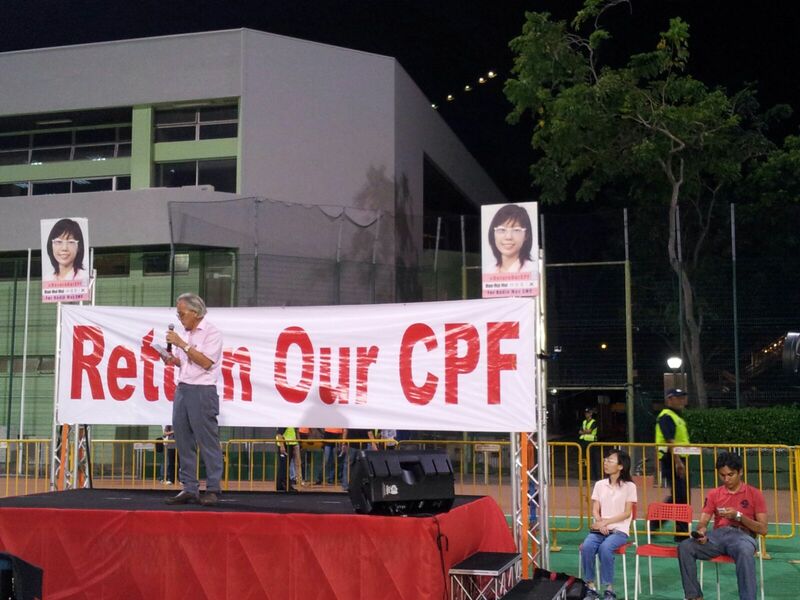 Chee Hong Tat takes the stage and says: "It is wrong for the opposition to think they can focus on local enterprises only, discounting MNCs. 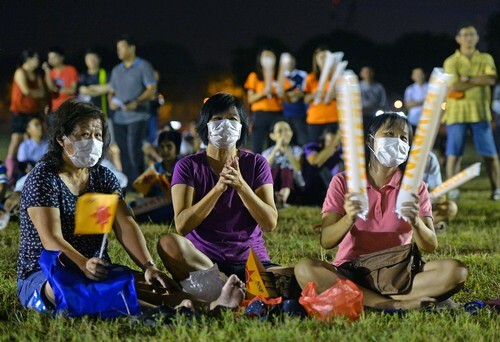 It doesn't make economic sense." 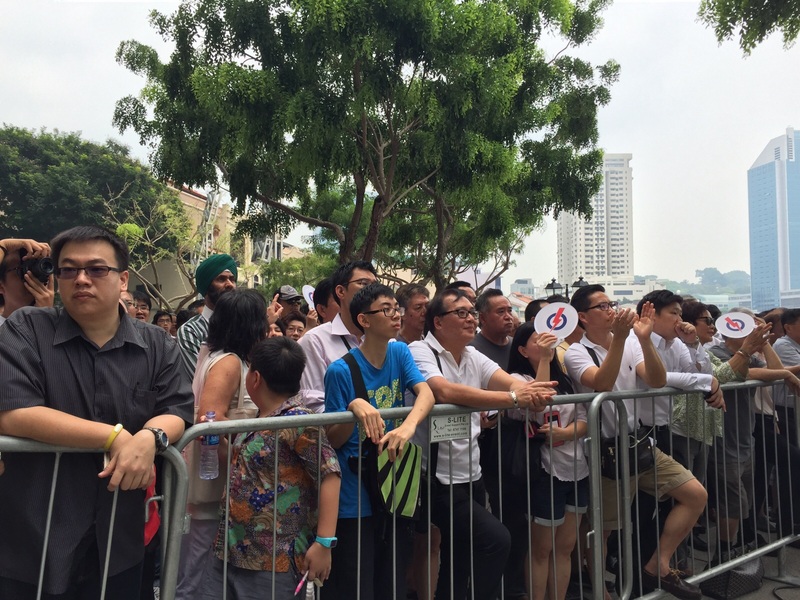 He asked: "If we lose these MNCs, many Singaporeans will lose their jobs." 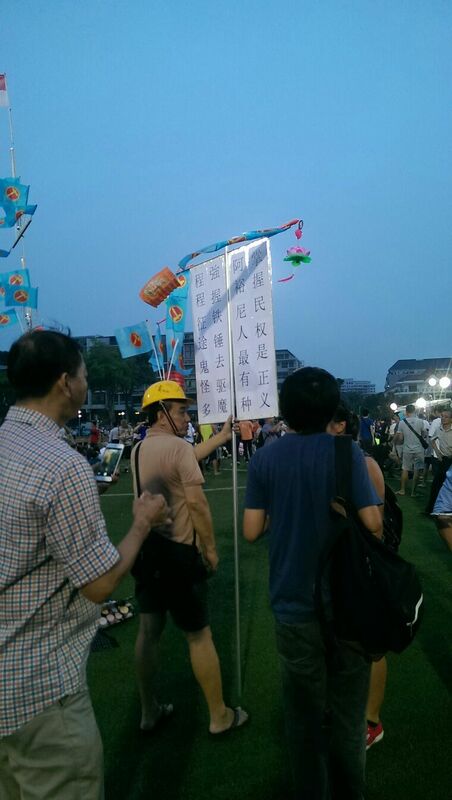 He says that he supports SMEs and local entrepreneurs. 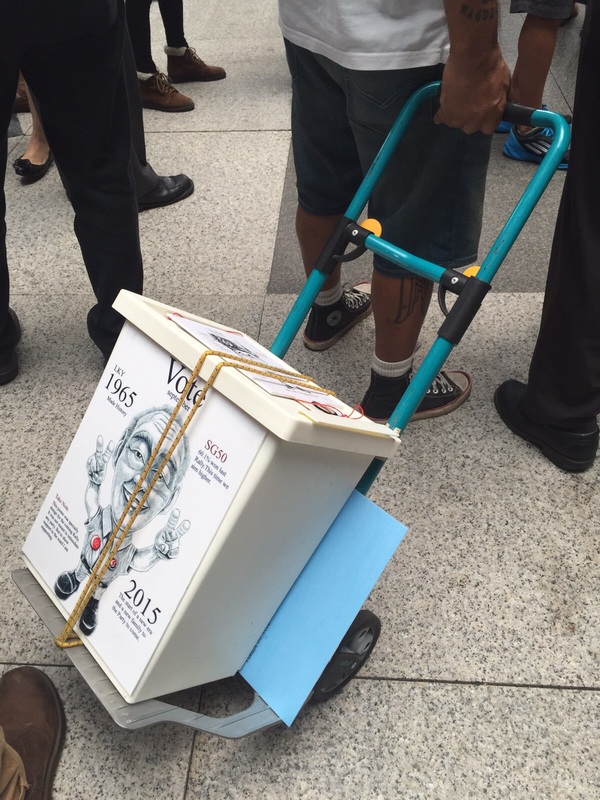 He says if he is elected he wants to fight for these companies to cut costs, in order to help them move forward. 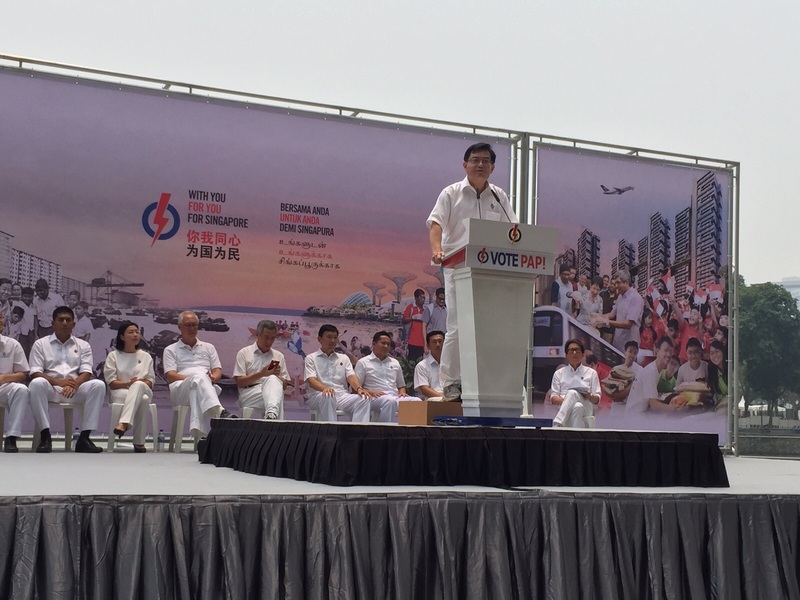 Education minister Heng Swee Keat takes the stage and says "I'm committed to make every school a good school." 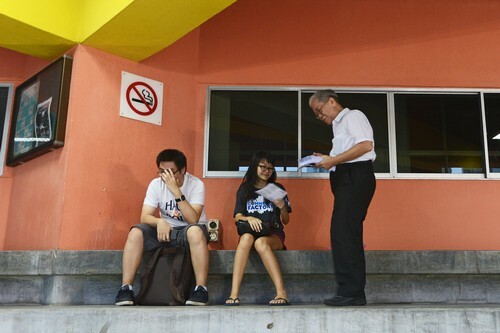 He added that this is why he is broadening the roads to education. 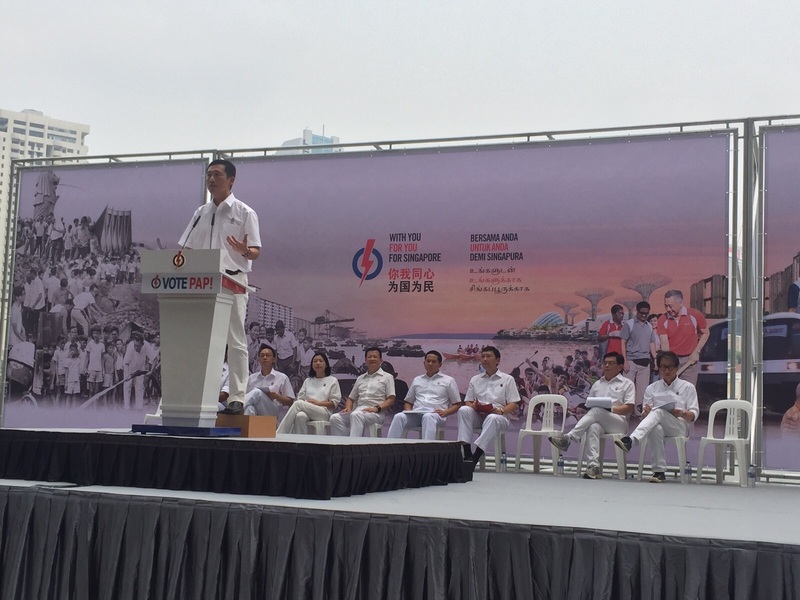 He also talked about the new SIT campus in Punggol. 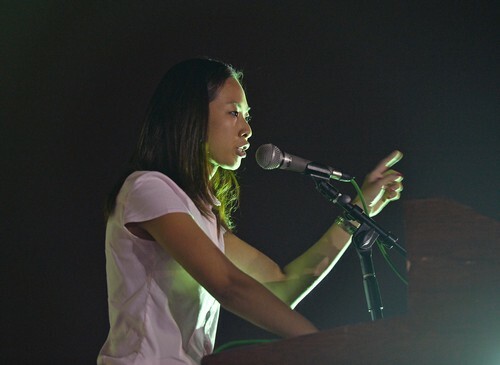 "We must give the best education opportunities to our people." 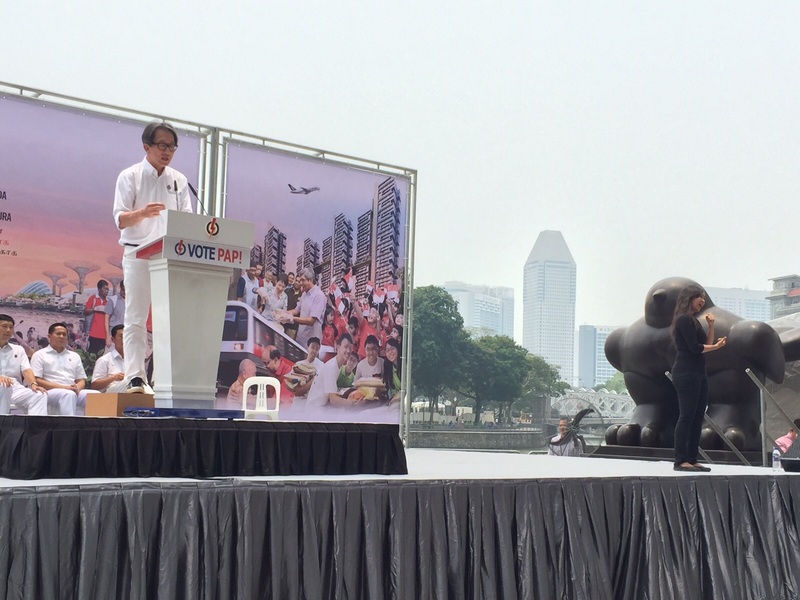 East Coast GRC candidate Lim Swee Say: "Our median wage of PMETs has increased by about 20% in the last five years." 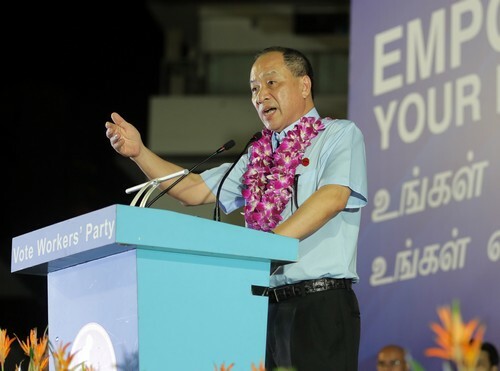 However he said that the PAP is still concerned as there are young PMEs who are unable to secure their jobs that they want due to inexperience. 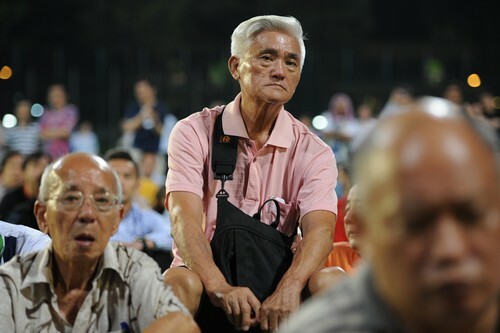 Mature workers who lost their jobs are unable to make a career switch because of higher number of foreign workers or lack of skills. 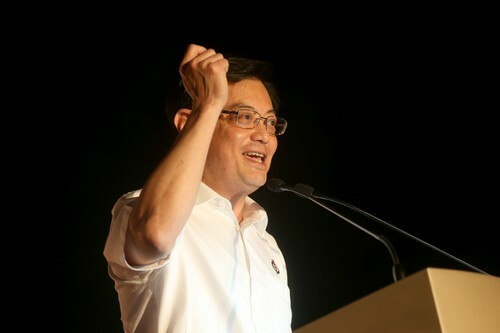 Mr Lim says that the PAP has since tightened the inflow of foreign workers. A drop of more than 90% in the last three years. 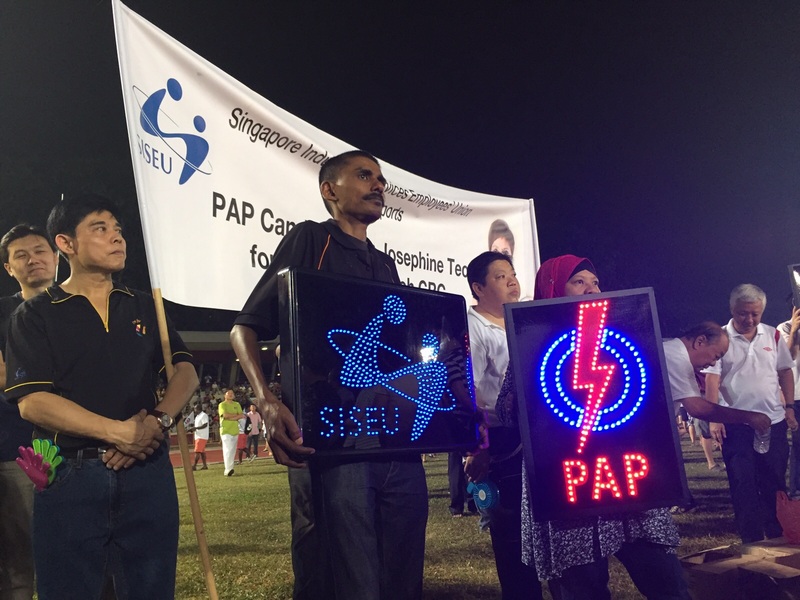 He says employers need to expediate the transferral of knowledge and skills from foreign PMETs to local PMETs. 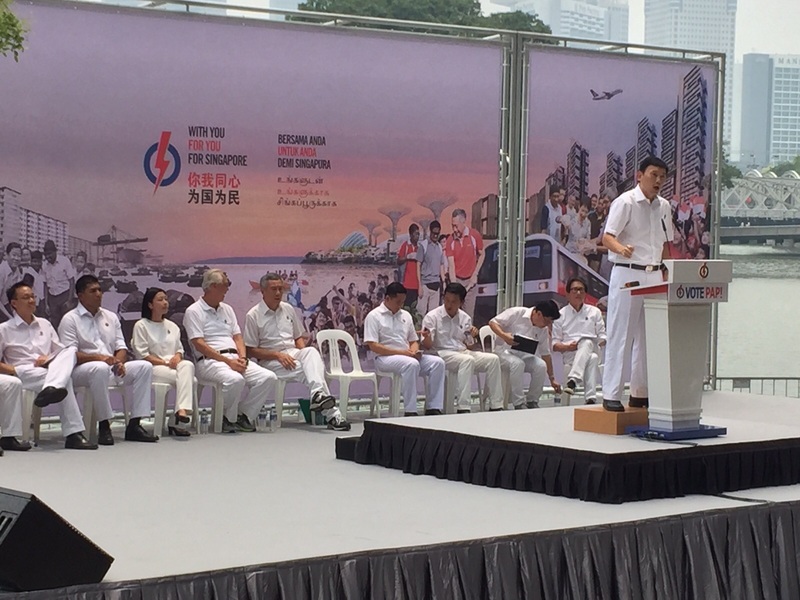 "So that our future Singaporean core will be in place to drive the future economy of Singapore." 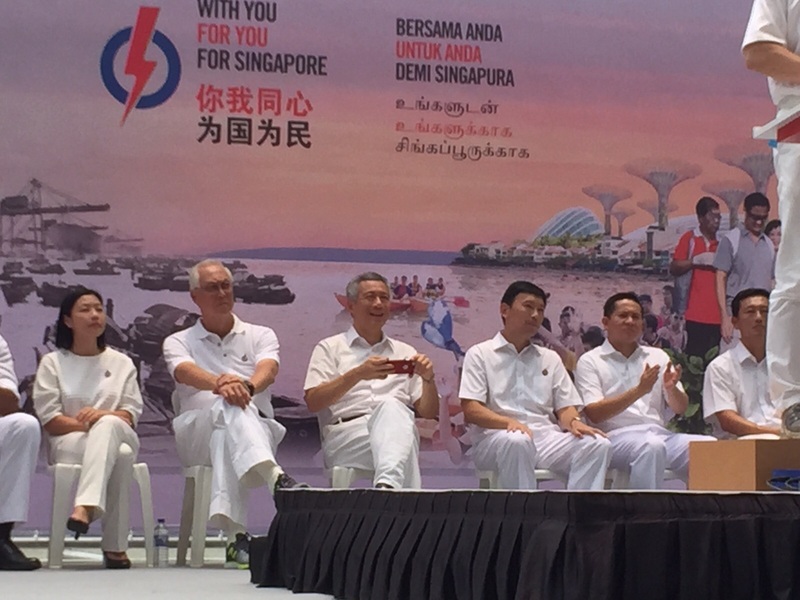 He says that the strength of the Singaporean core is not measured in terms of numbers but the roles played by the local PMETs. 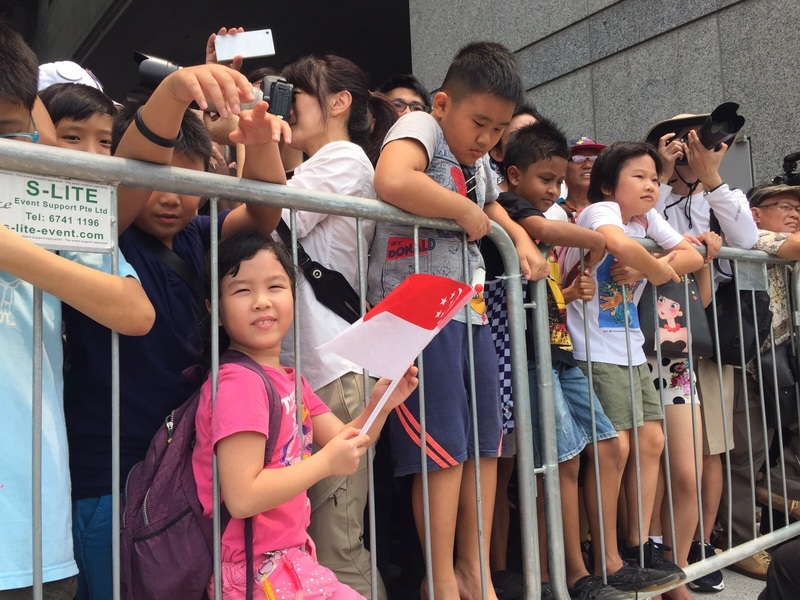 PM Lee said he was heartened by the number of Singaporeans showing up to pay their respects to the late Mr Lee Kuan Yew. 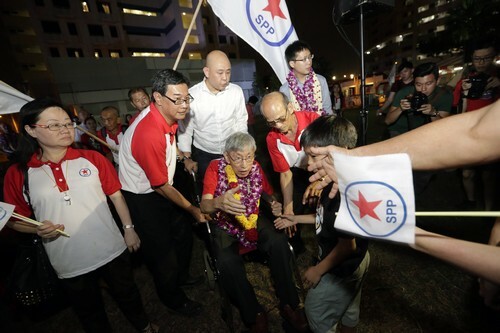 He said that Mr Lee embodied the indomitable spirit of Singapore. 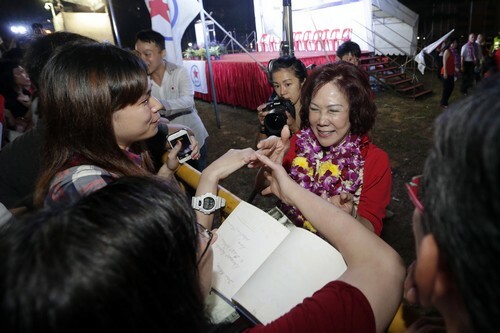 "SG50 is not a destination it is a start of a new chapter. 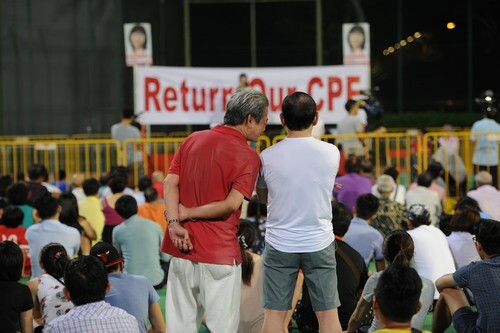 Now how do we go forward from here?" 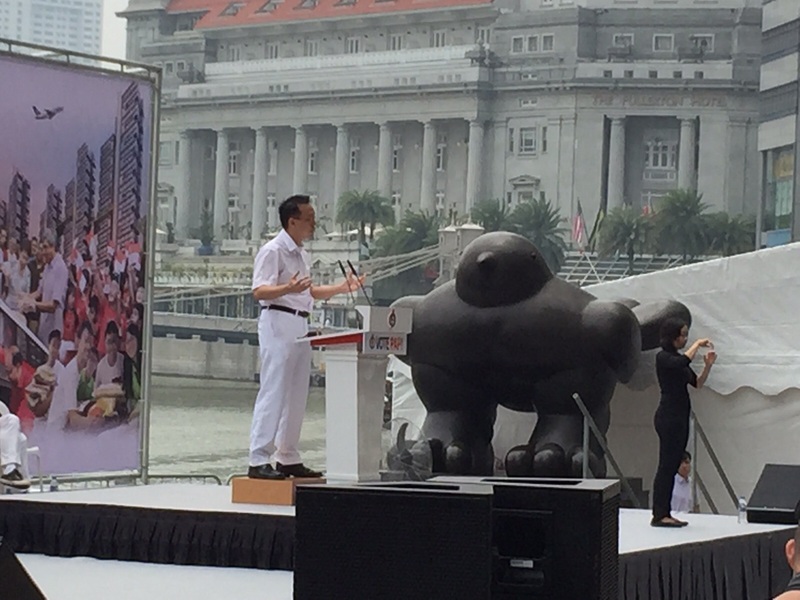 He said that he called for elections to seek a new mandate to take Singapore forward to a new SG50. 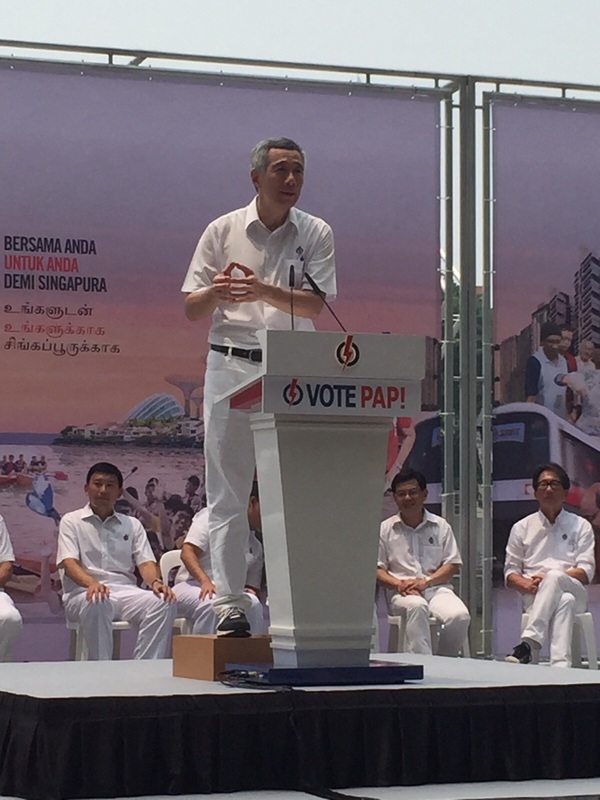 PM Lee: "I believe we can climb higher." 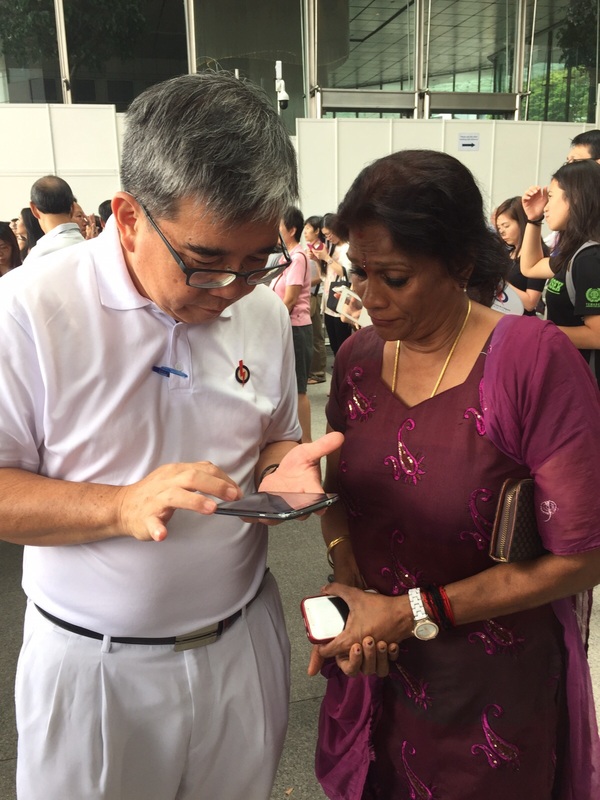 He asked if Singaporeans had the same spirit as our pioneers. 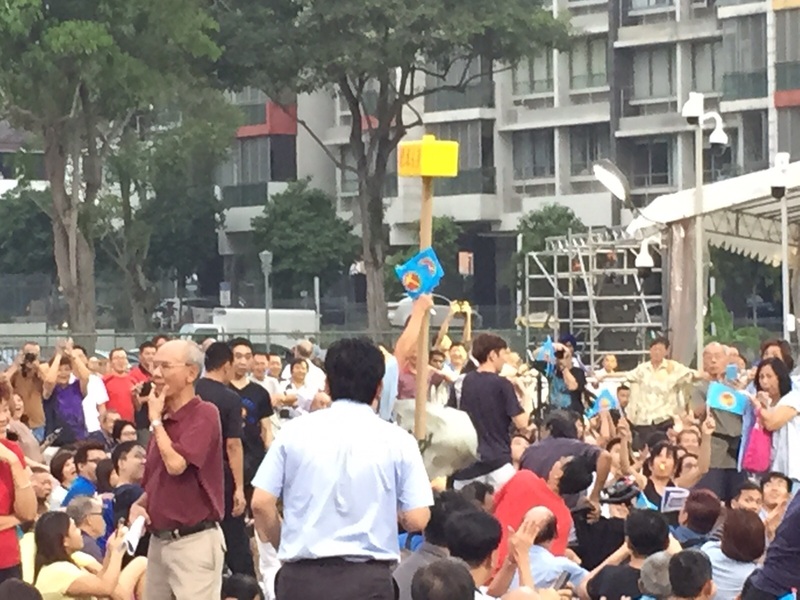 Shouts of "Yes!" 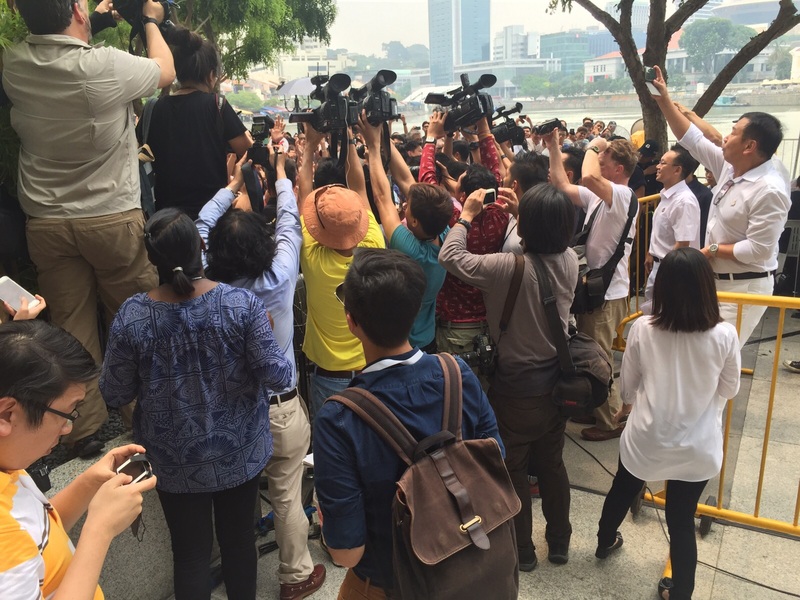 resounded. 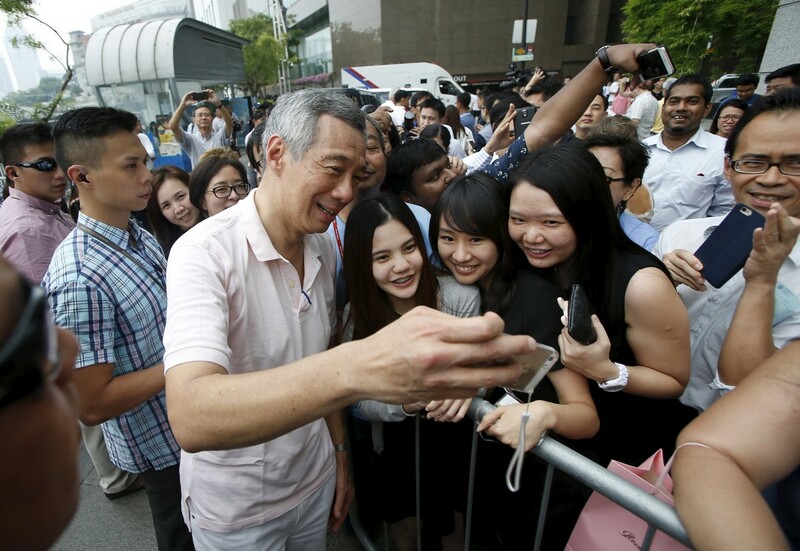 PM Lee then said that Singaporeans must be prepared to "buckle up", work hard and sacrifice for the future generations. 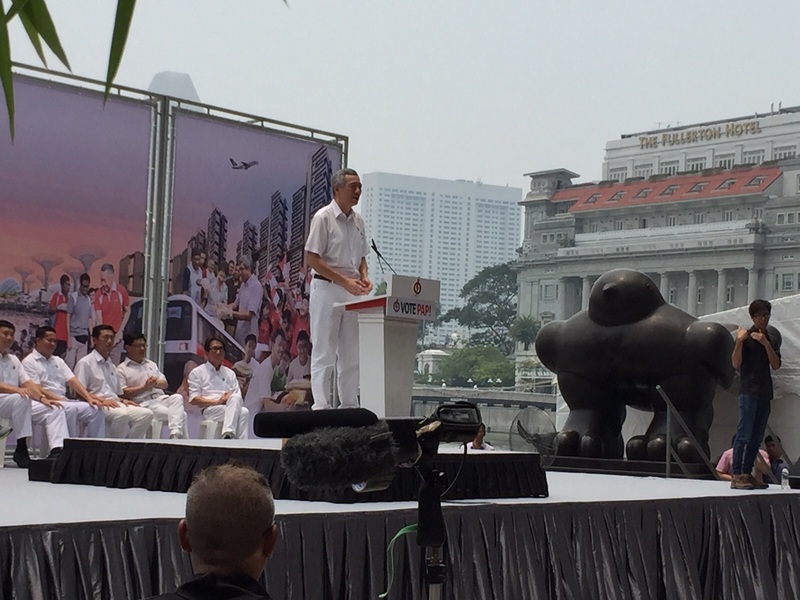 PM Lee talks about the Pioneer Generation package, the Medishield Life policy, Silver Support Scheme as well as the higher interests in CPF. 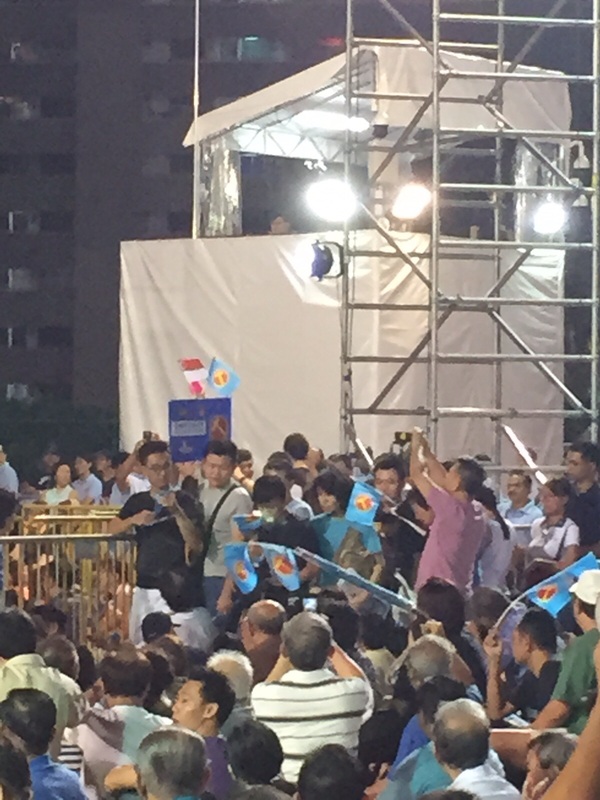 He said all these policies helped to support the needs of people. 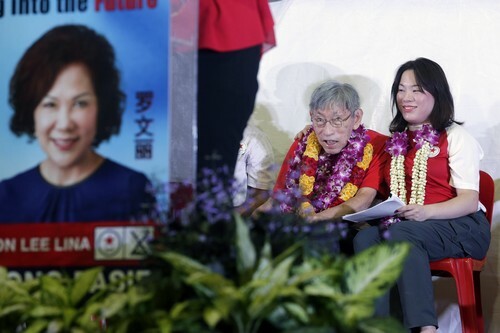 He says since the last elections, the PAP has improved the baby bonus, introduced paternity leave, increased housing grants for lower income families and built more HDBs. 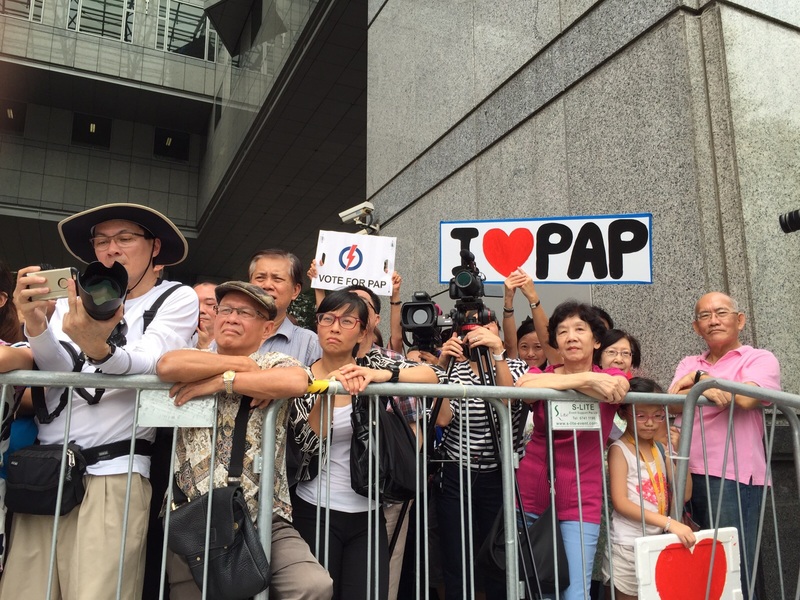 He added that the PAP has lightened the load of the sandwich generation. 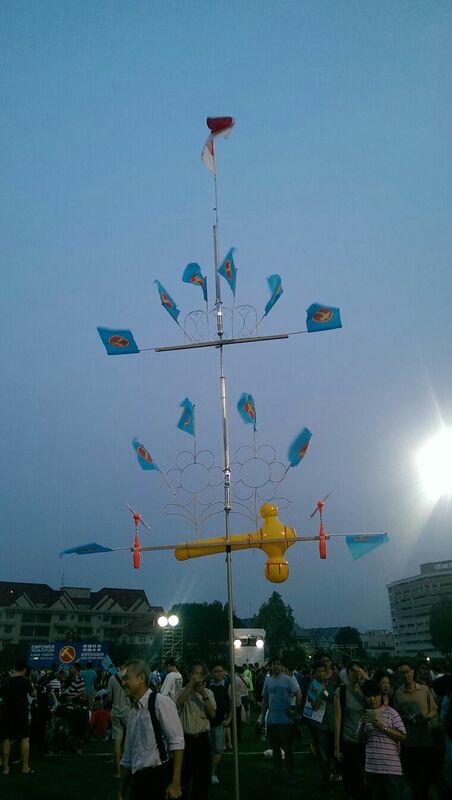 The PGP also serves to ease the burden off young people who need to take care of their parents. 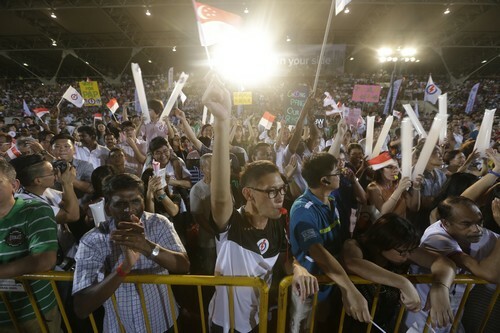 The crowd listening to PM Lee. 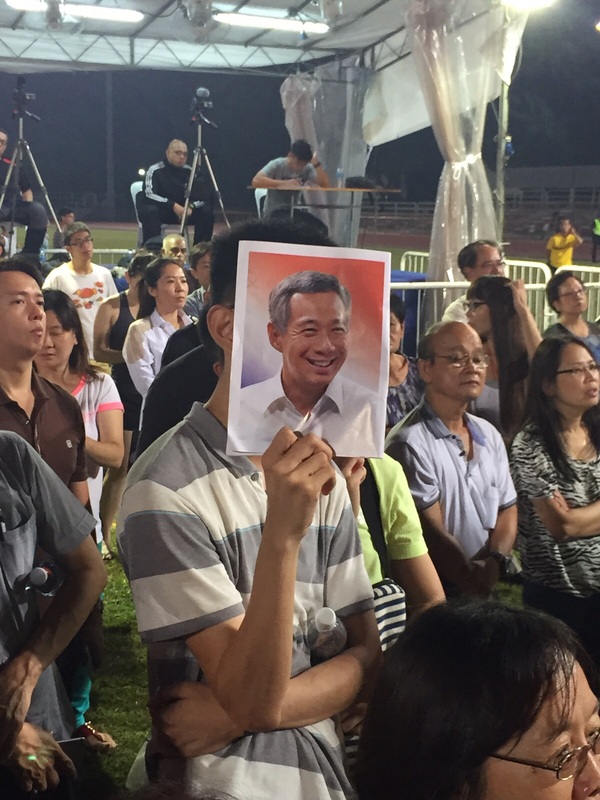 PM Lee says that even though Mr LKY is gone, Singaporeans must still have iron in our hearts. 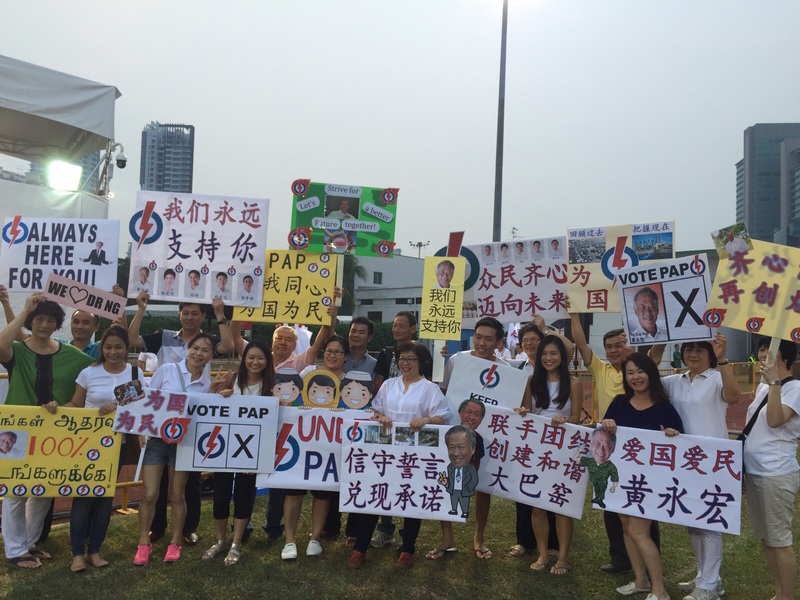 "As long as the PAP is in charge, nobody can knock us down." 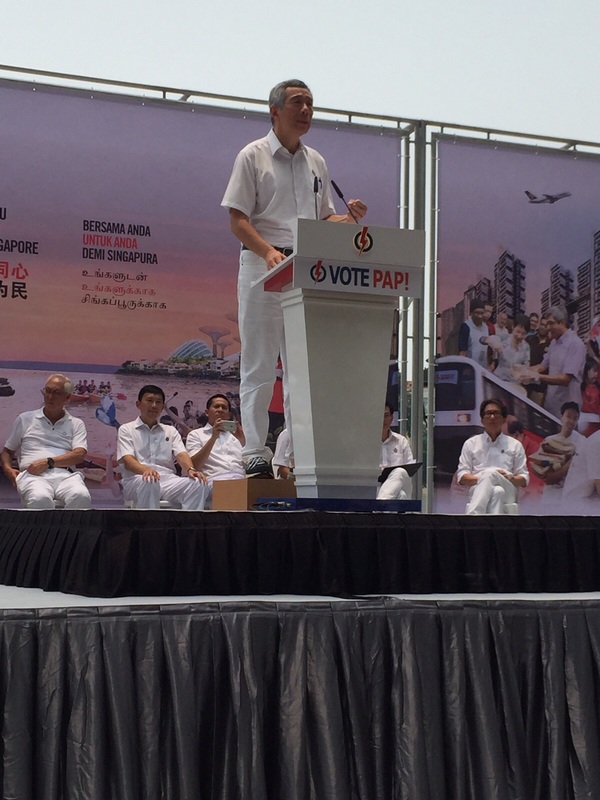 PM Lee calls on supporters to "vote for the party that has never let you down." 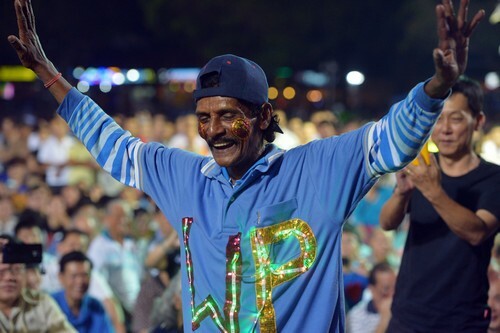 He had also said: "This is not a game of cards, it is your life and mine." 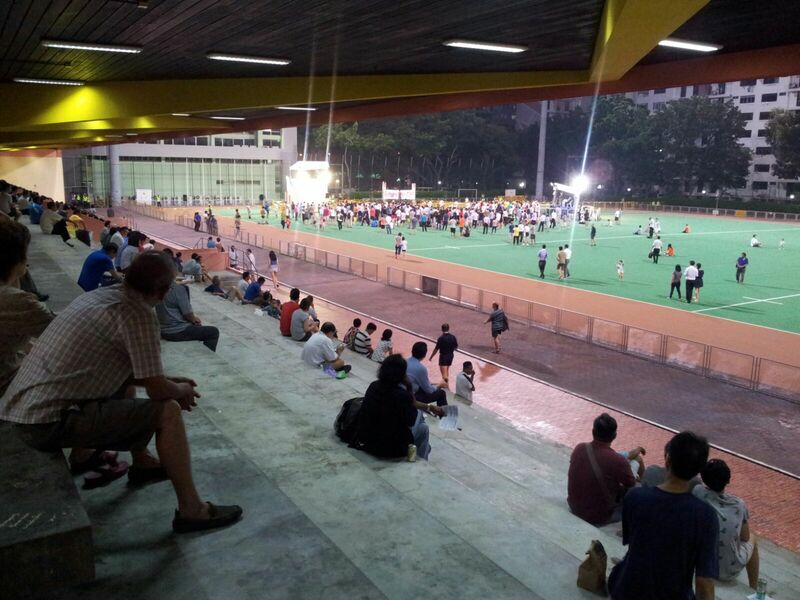 When the rally was done. 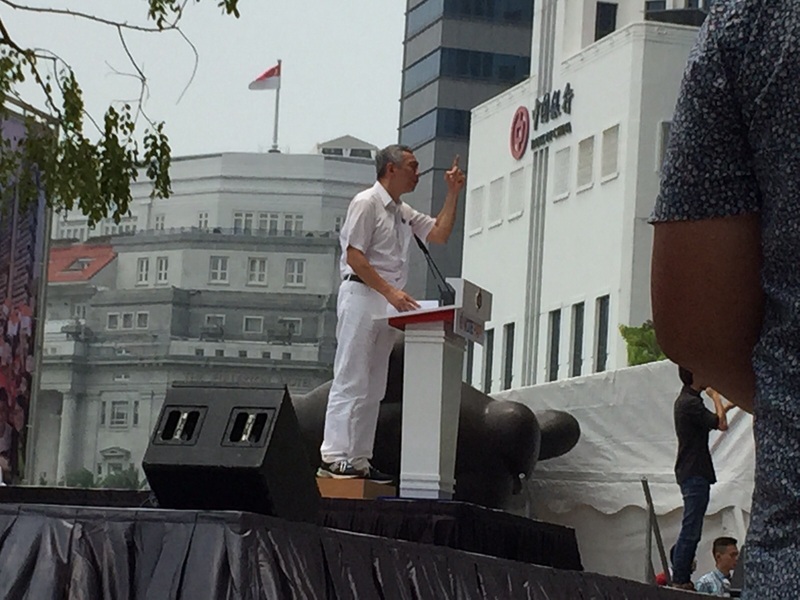 PAP's Amrin Amin speaking during the rally. 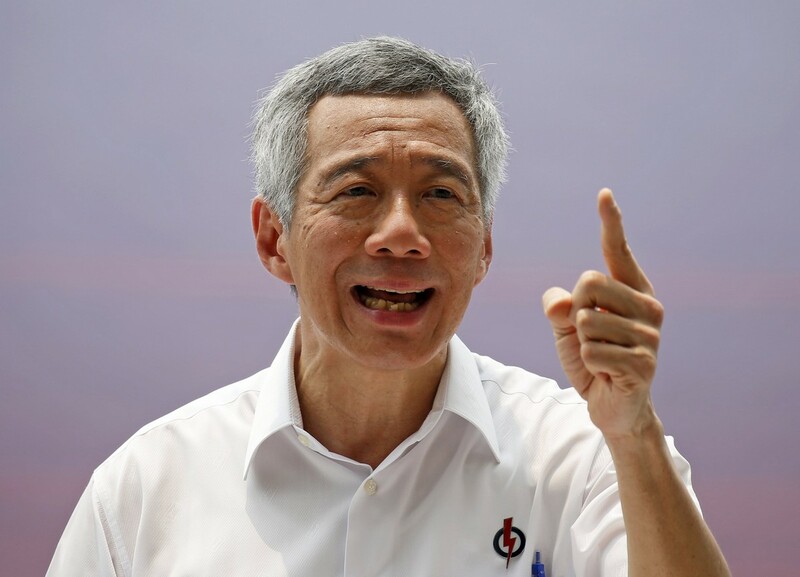 While talking about Singapore's efforts against corruption, PM Lee took aim at the WP's AHPETC, saying: "That is why we also have the Auditor-General's Office, to keep the government straight, to keep our statutory boards straight, and once in a while, to find out if the town councils are straight, or not straight." 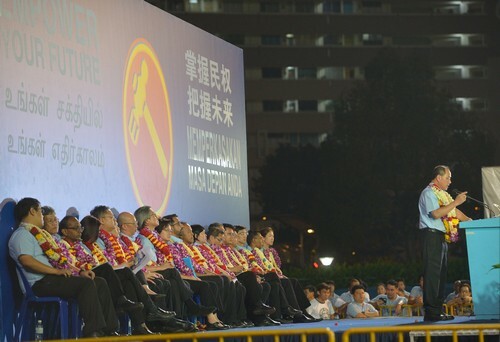 PM Lee also spoke about the wishlist by the opposition. 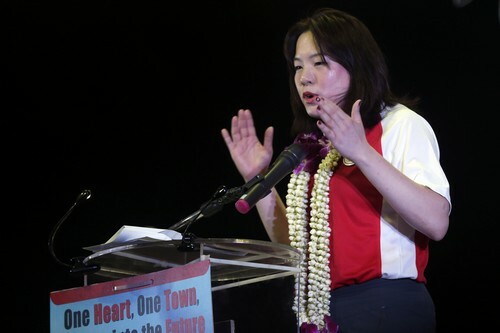 "Free health care, $300 for old people, $300 for young people, free taxi rides if you need to see a doctor, minimum wage. Everything can. 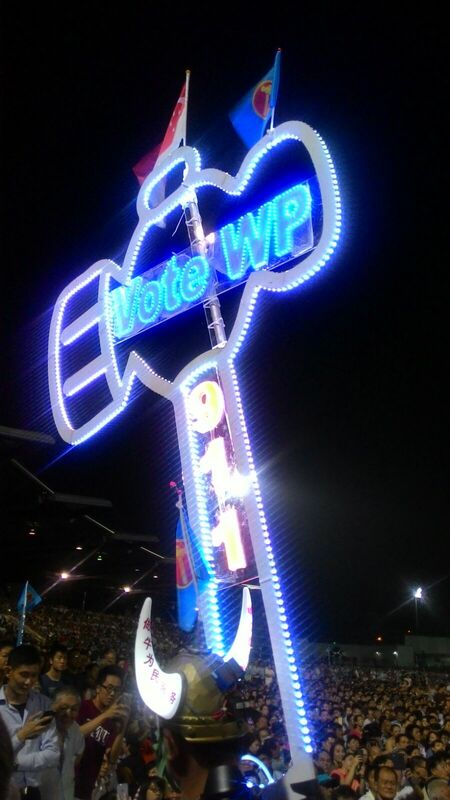 Who to pay?" 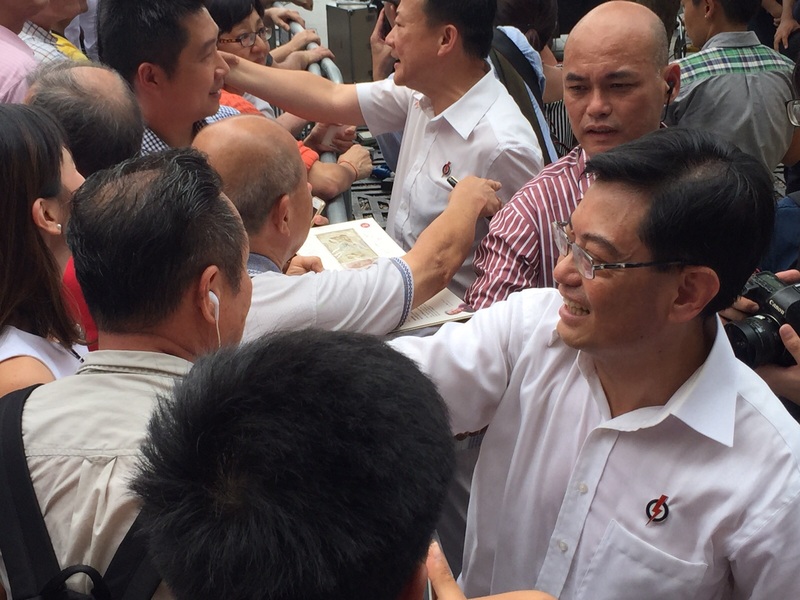 Mr Lee, who was wearing a white shirt when he delivered his speech at the lunchtime rally, was spotted in a pink polo T-shirt and mingling with the crowd soon after his speech ended.